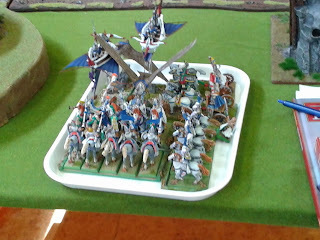 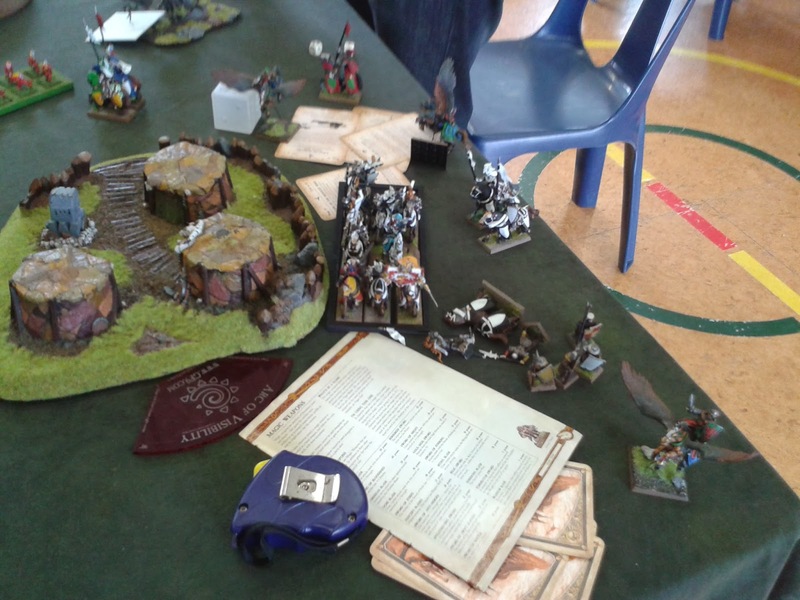 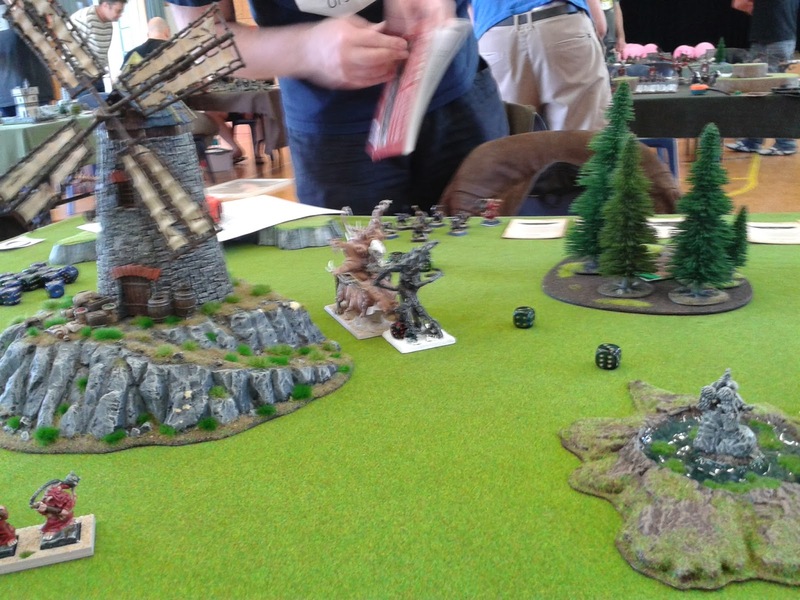 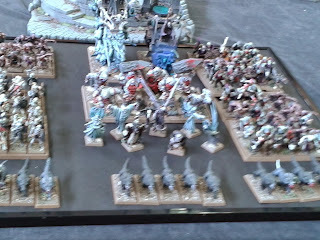 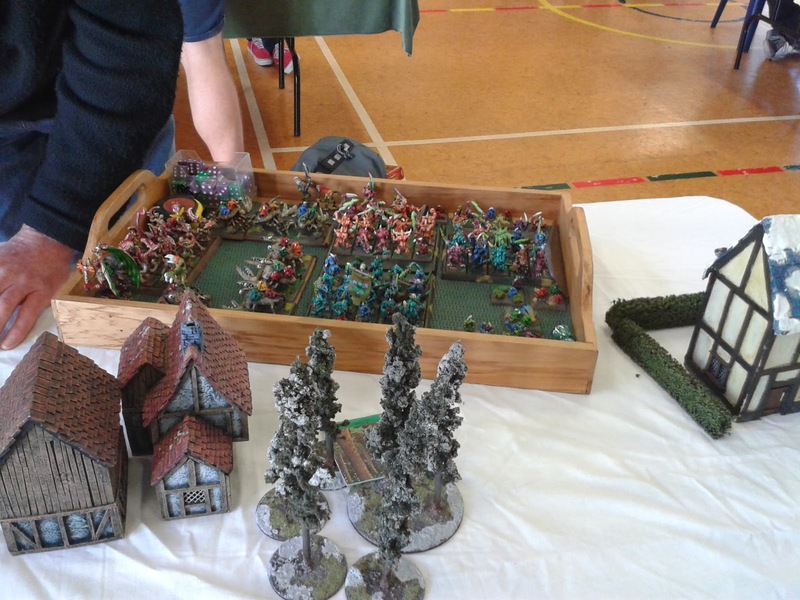 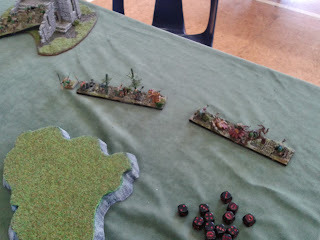 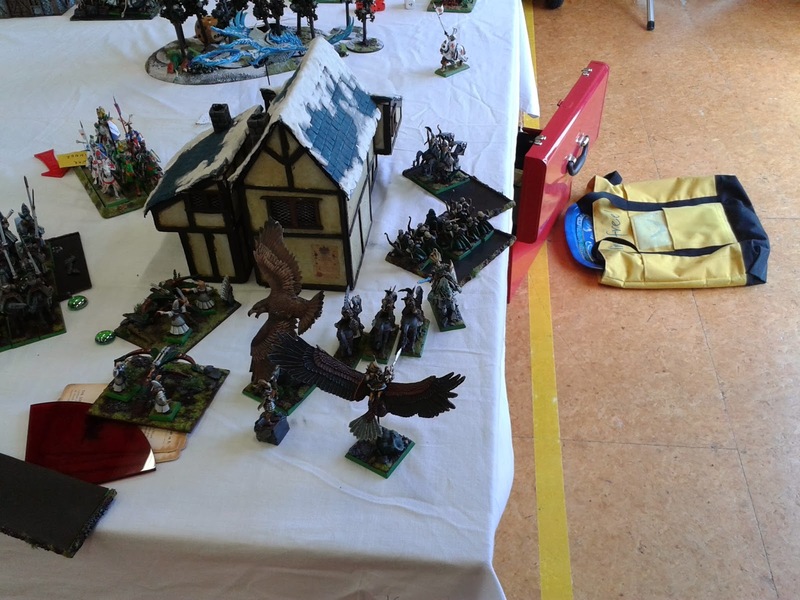 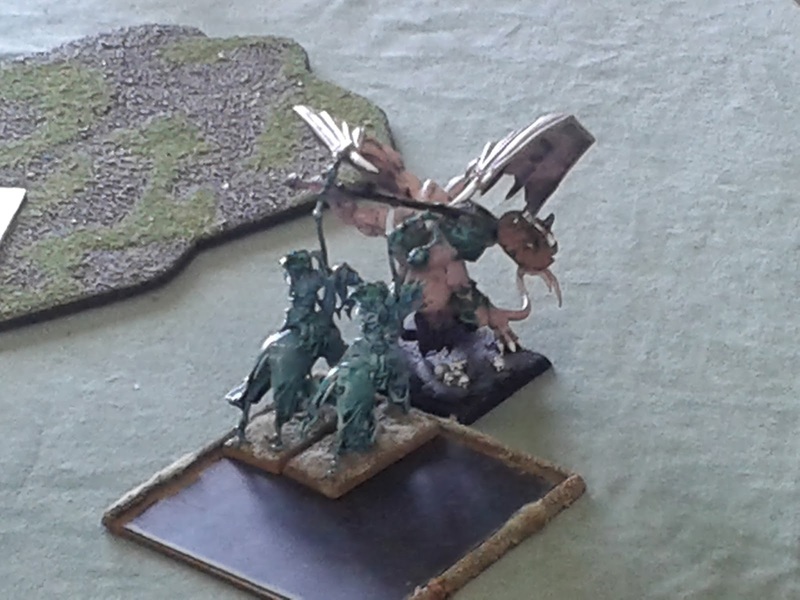 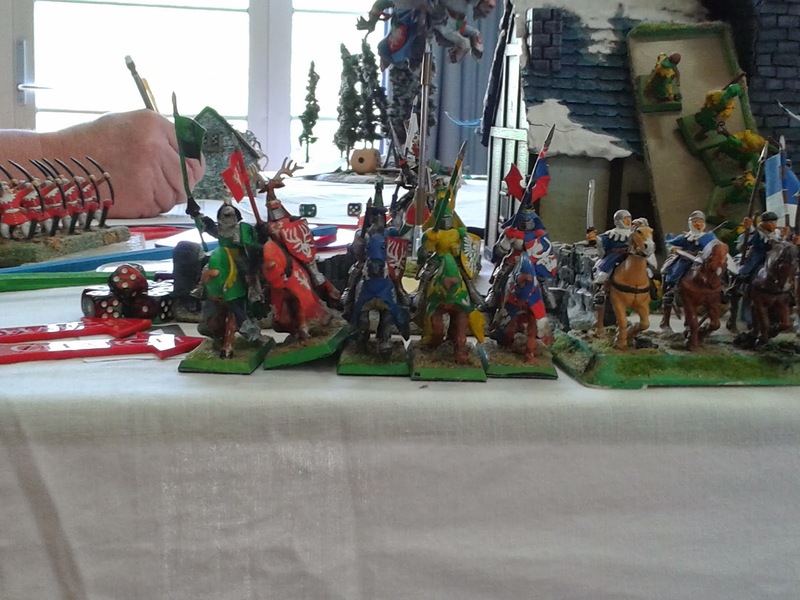 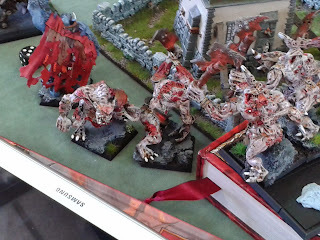 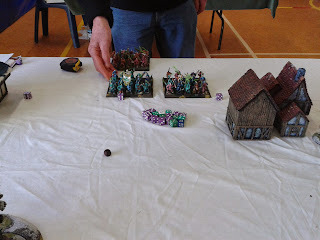 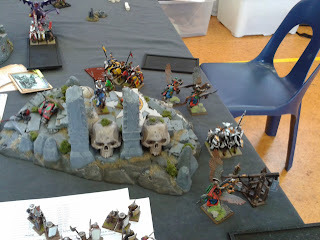 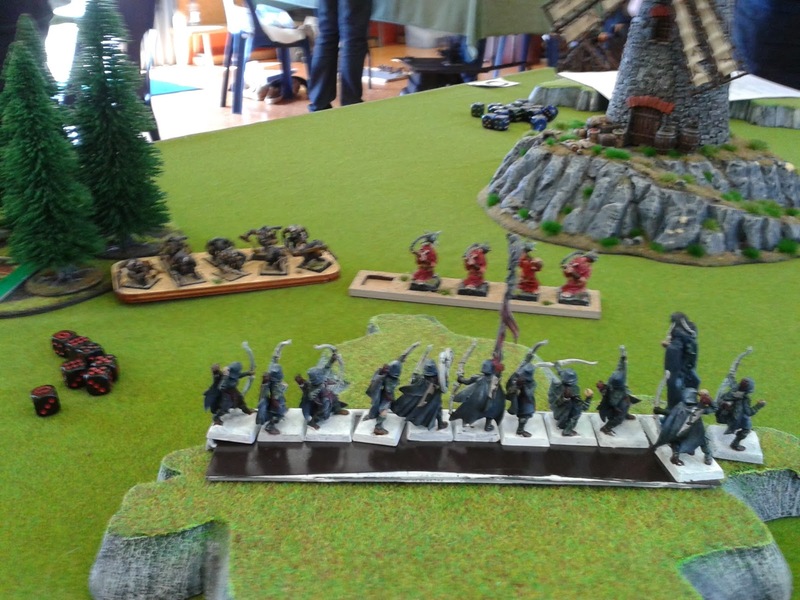 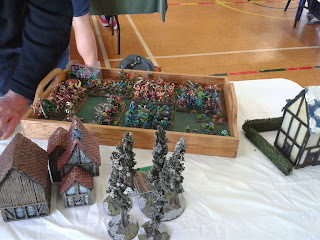 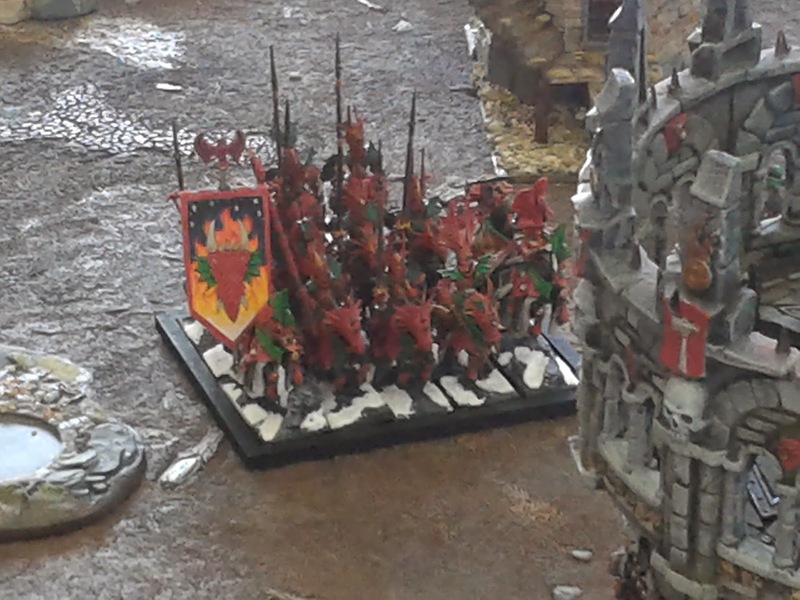 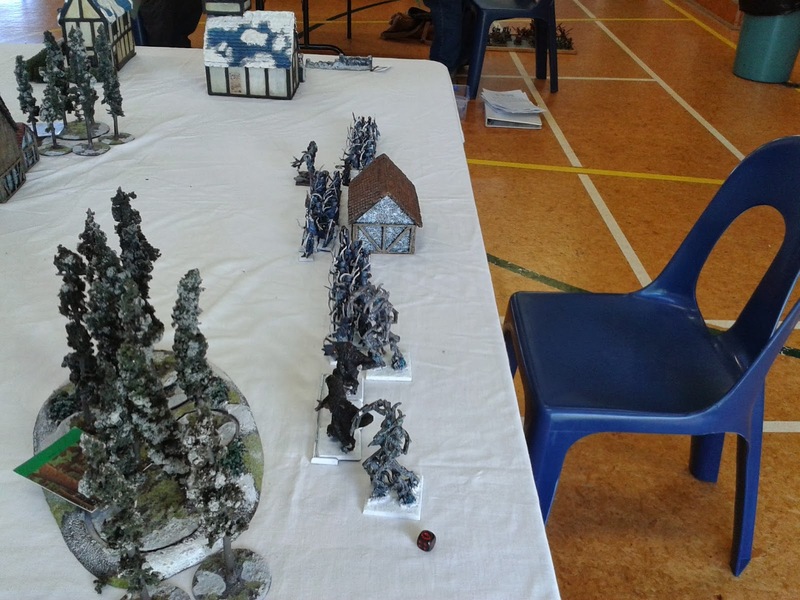 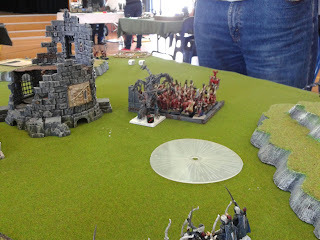 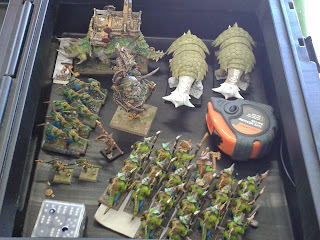 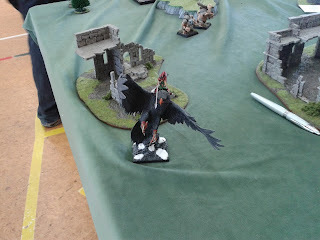 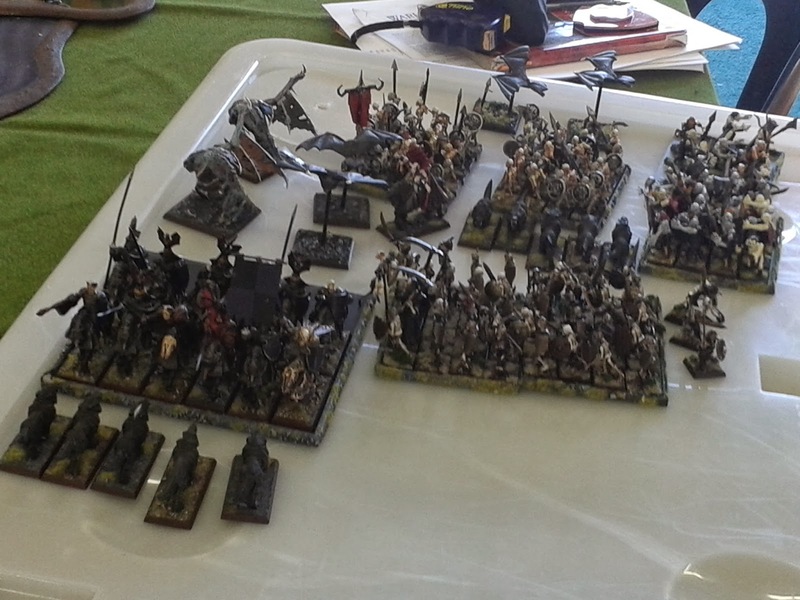 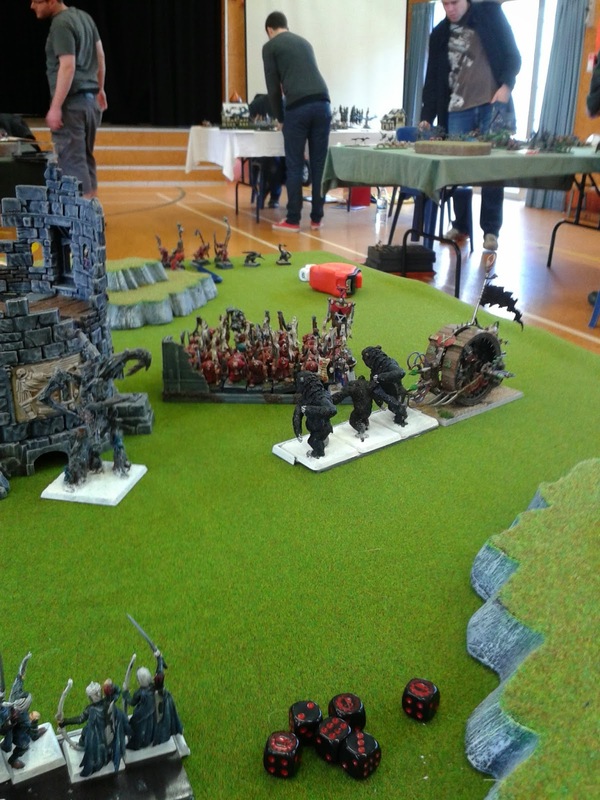 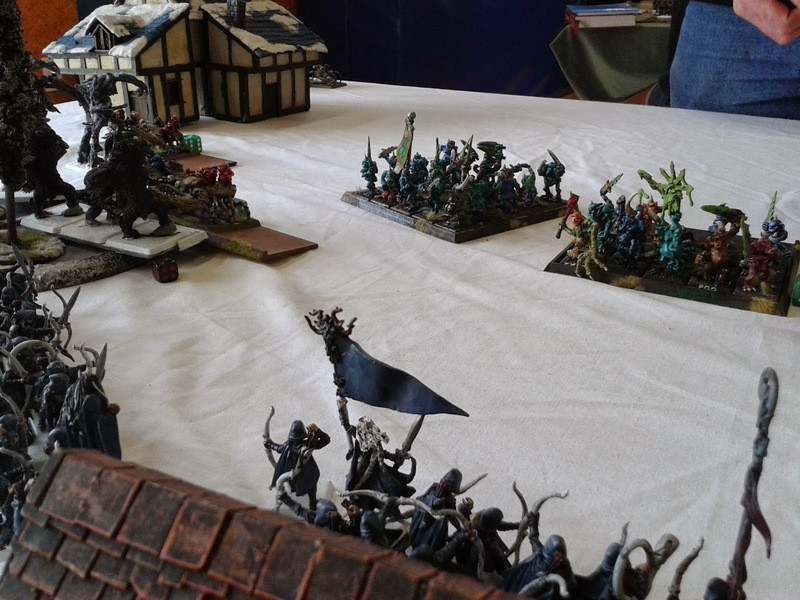 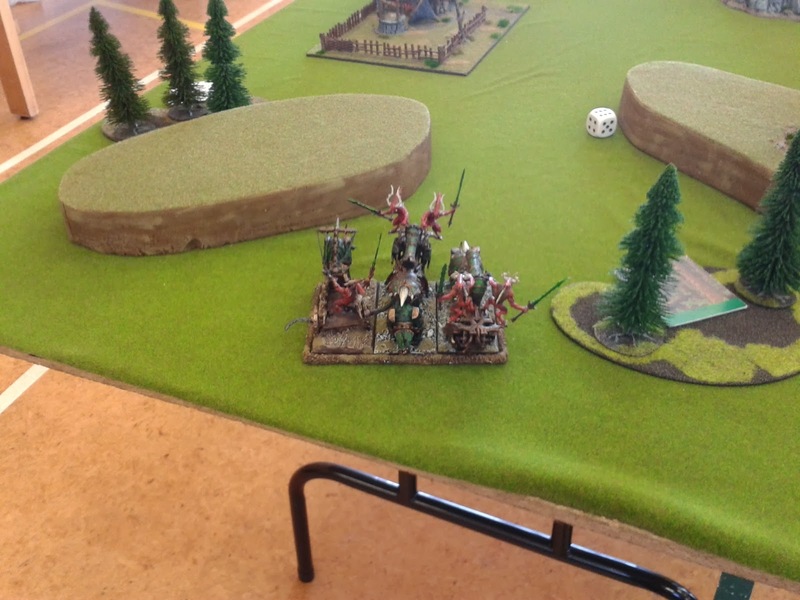 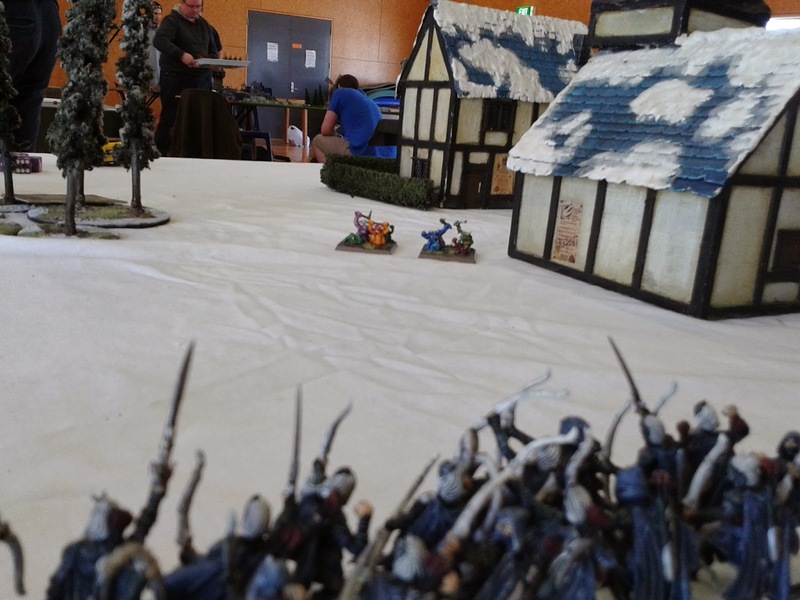 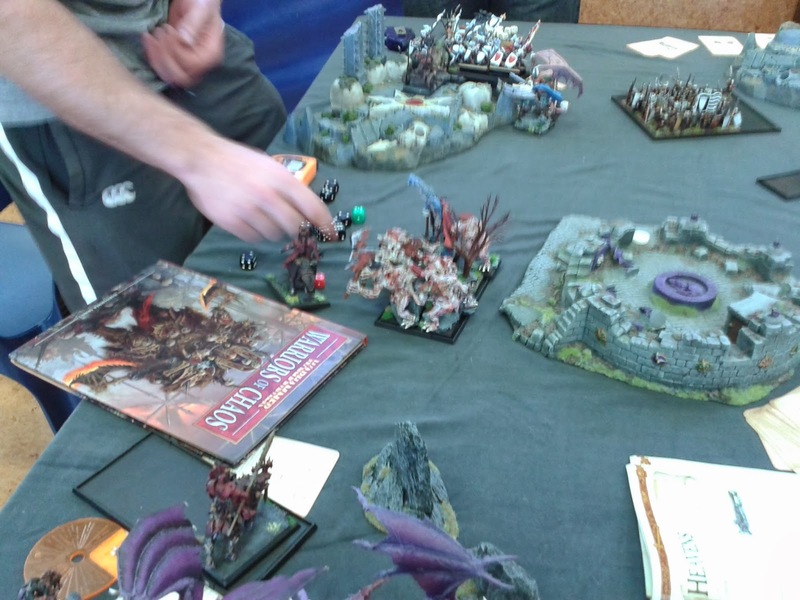 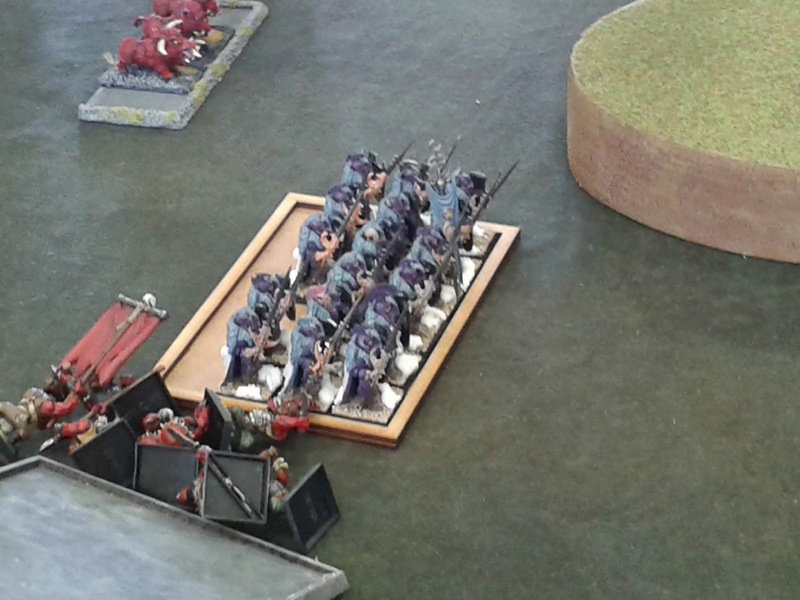 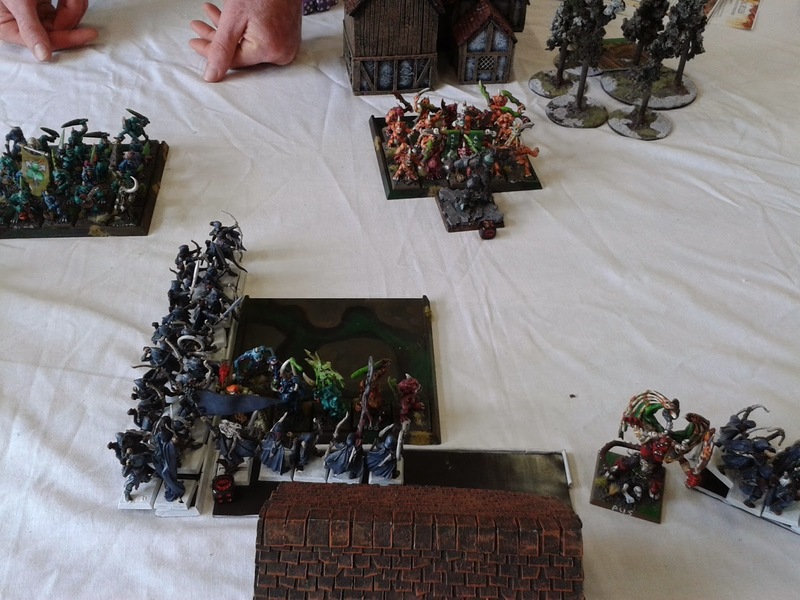 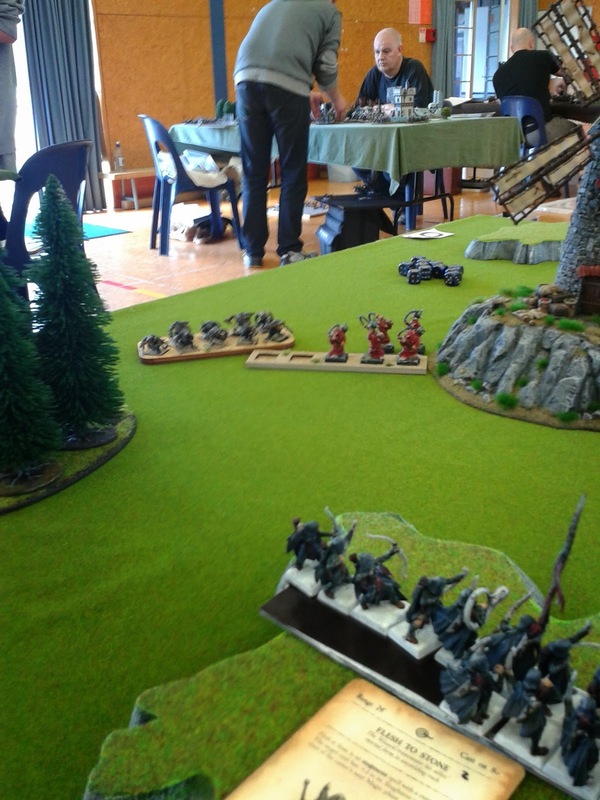 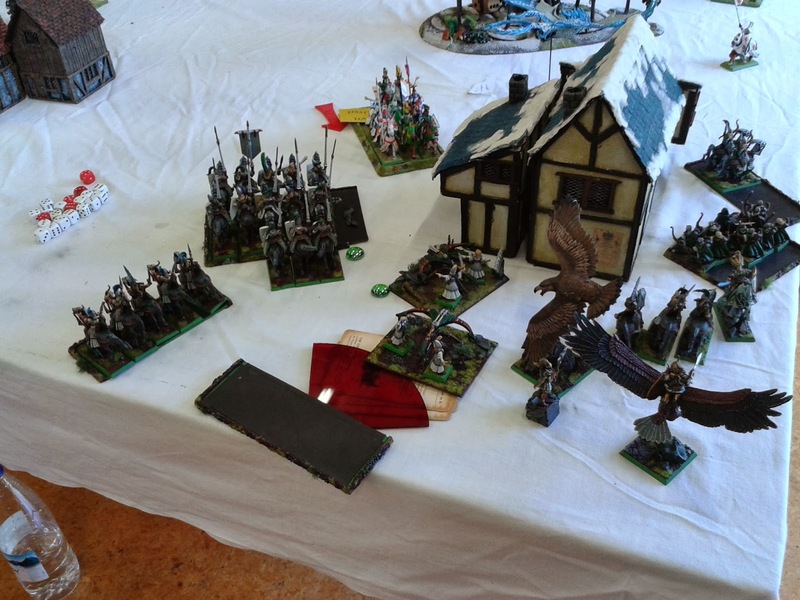 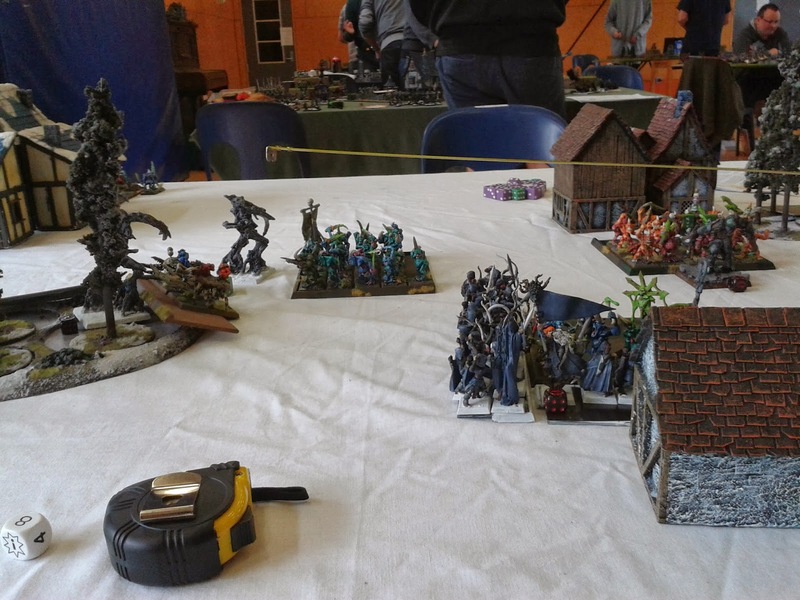 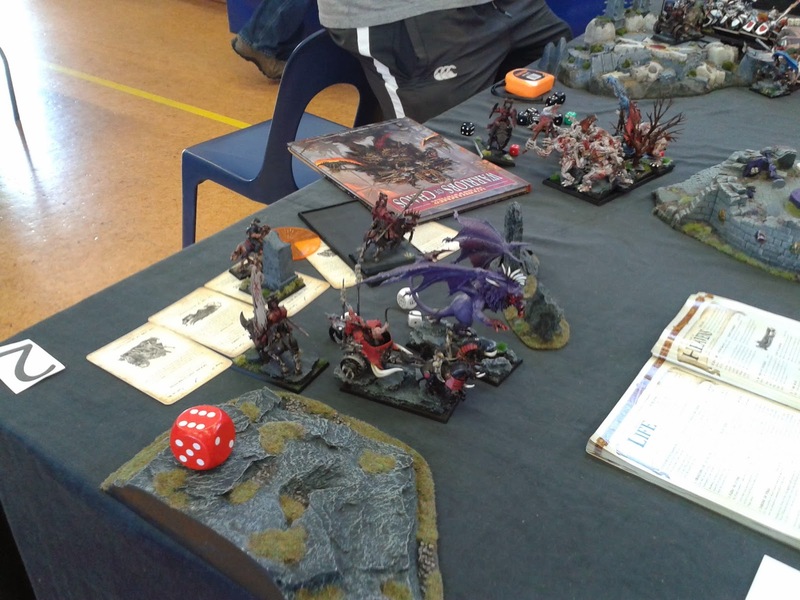 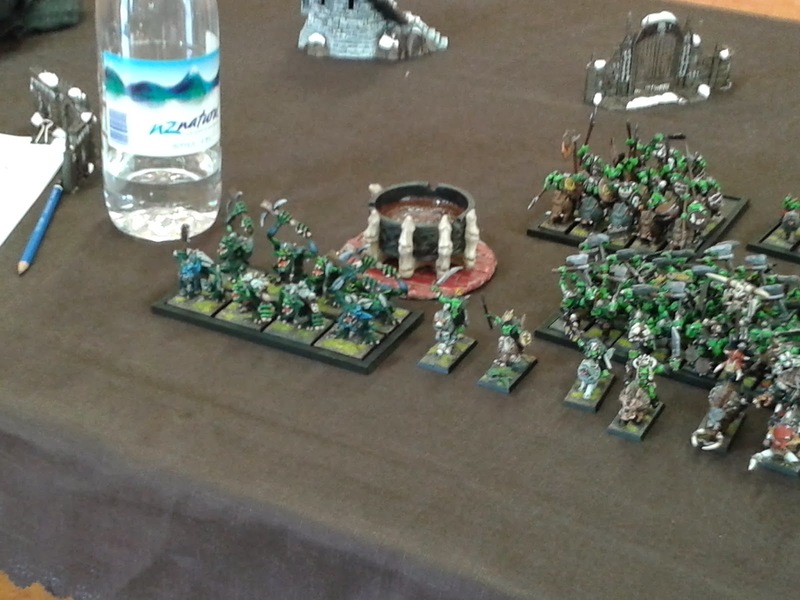 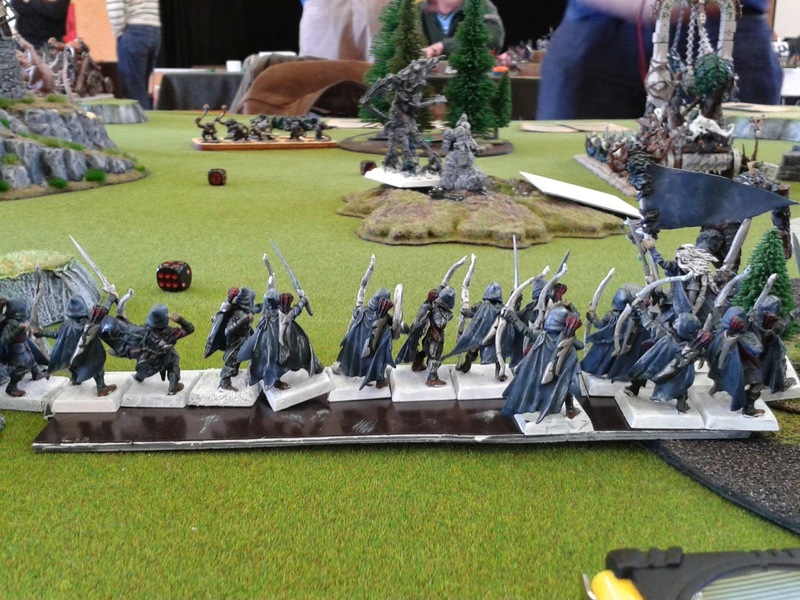 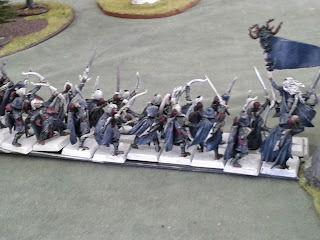 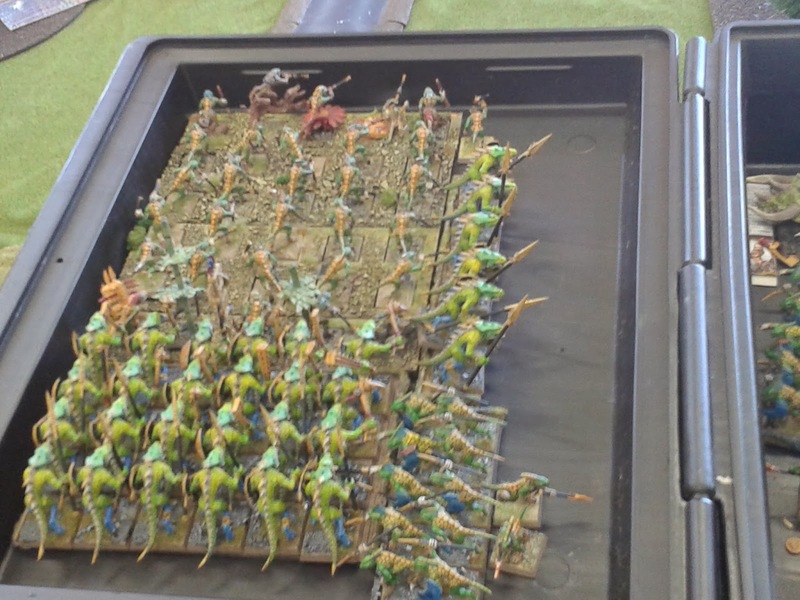 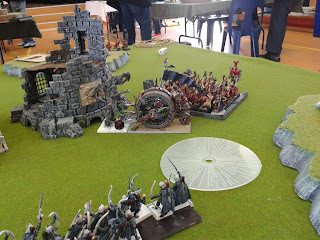 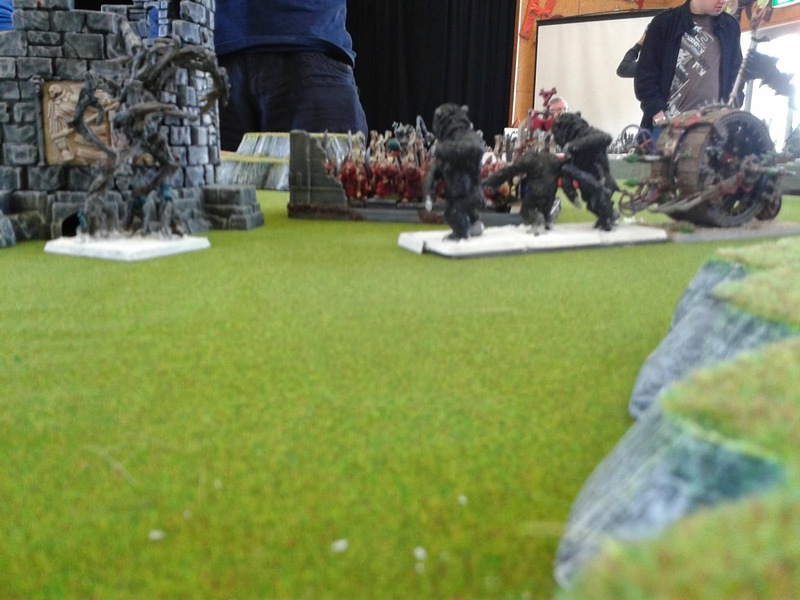 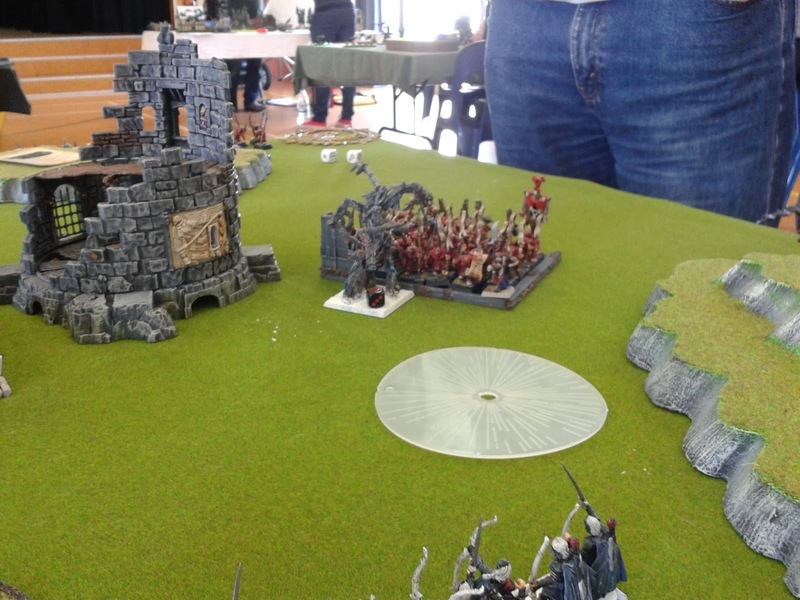 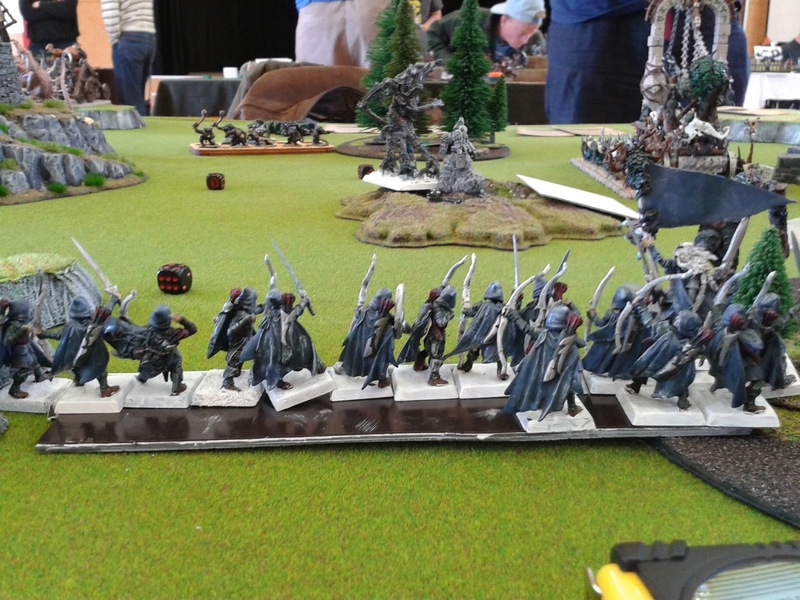 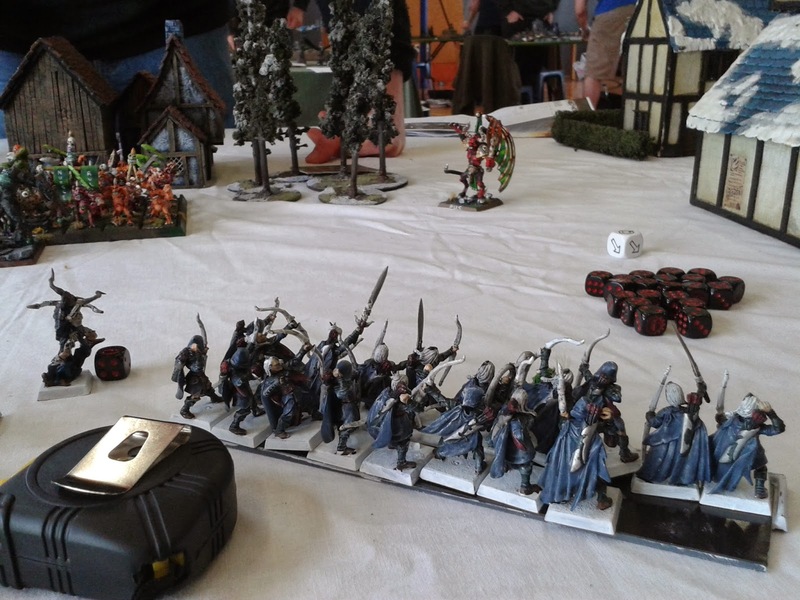 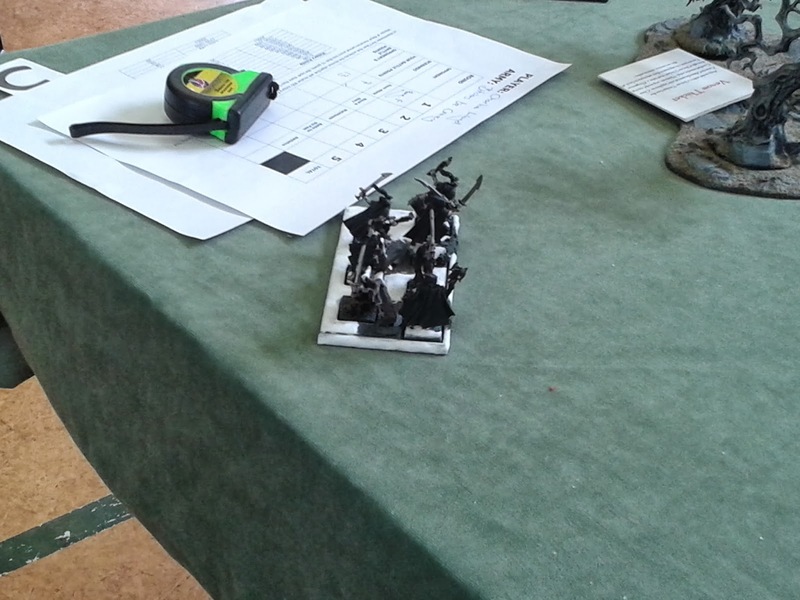 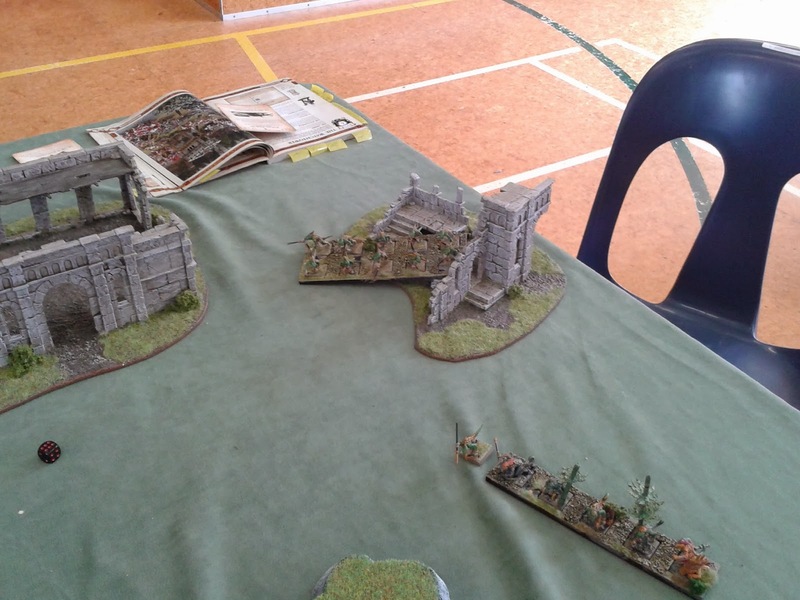 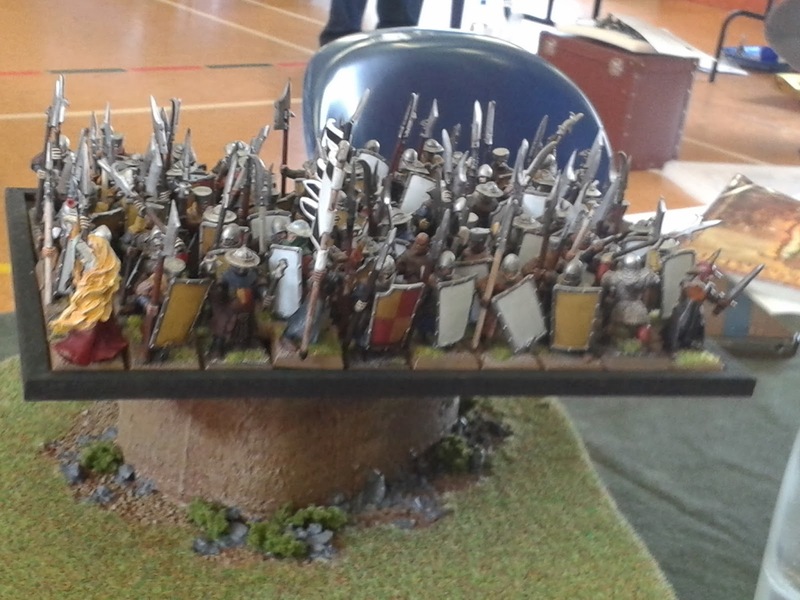 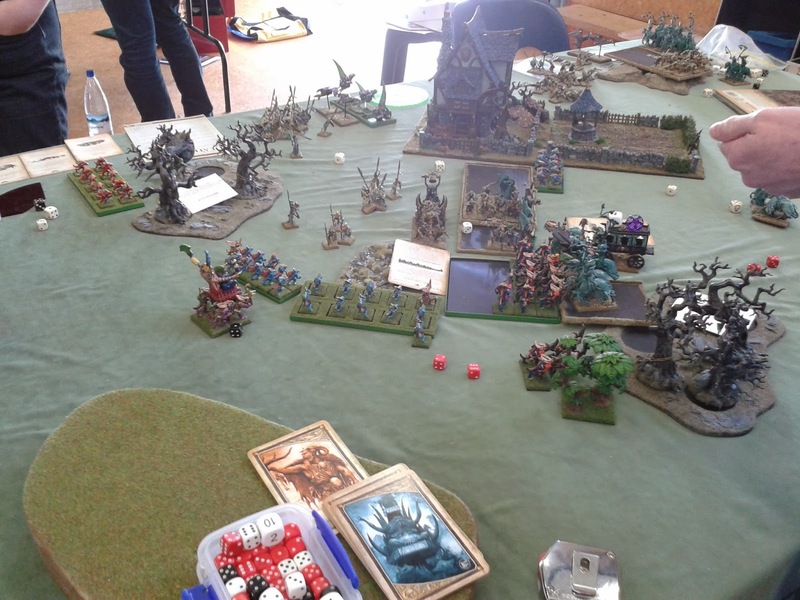 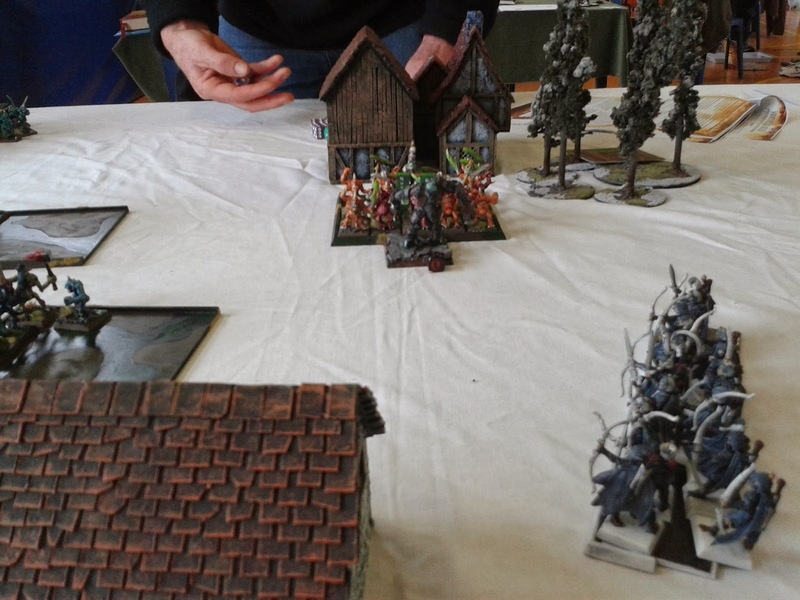 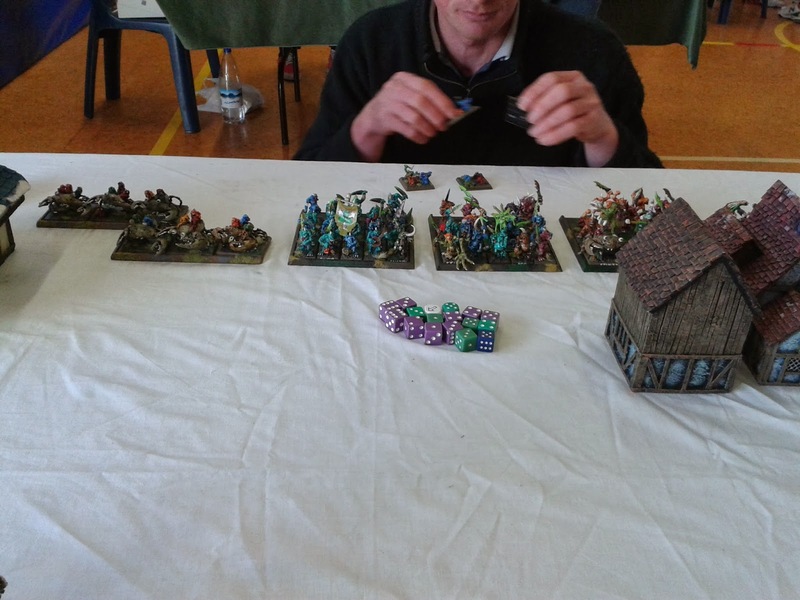 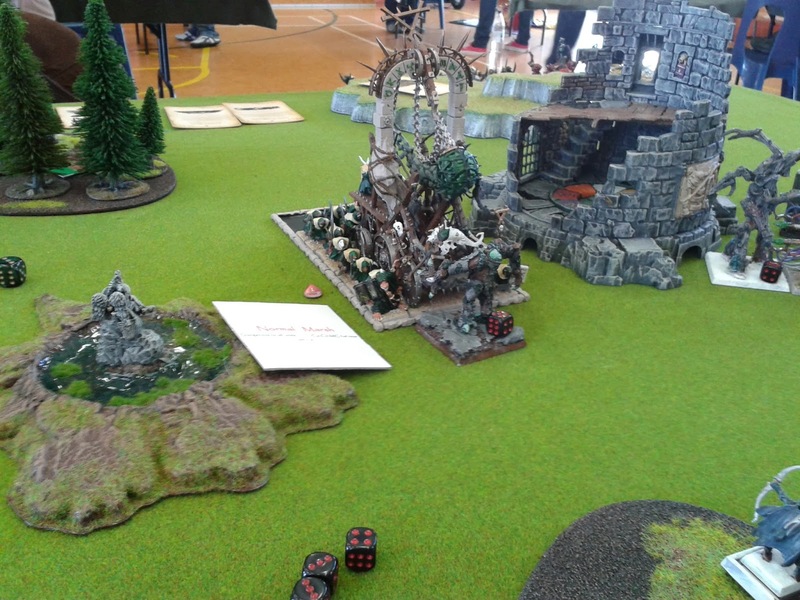 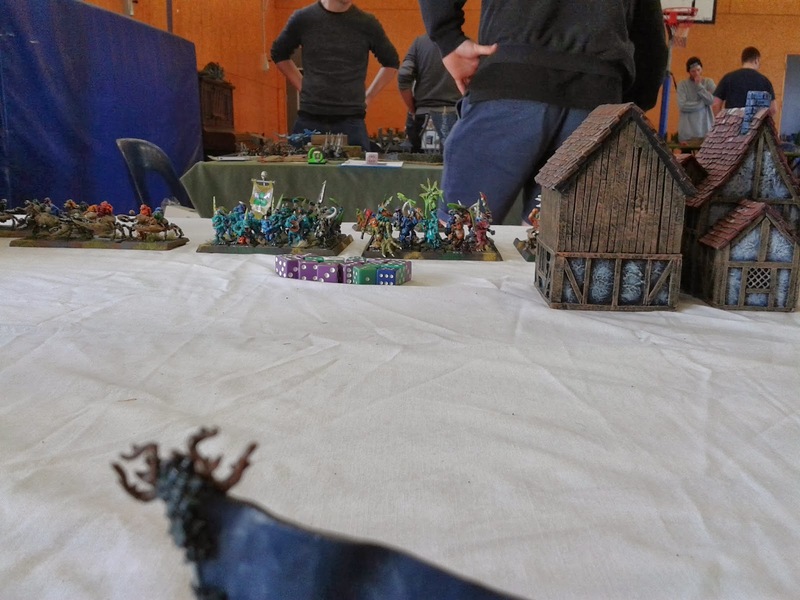 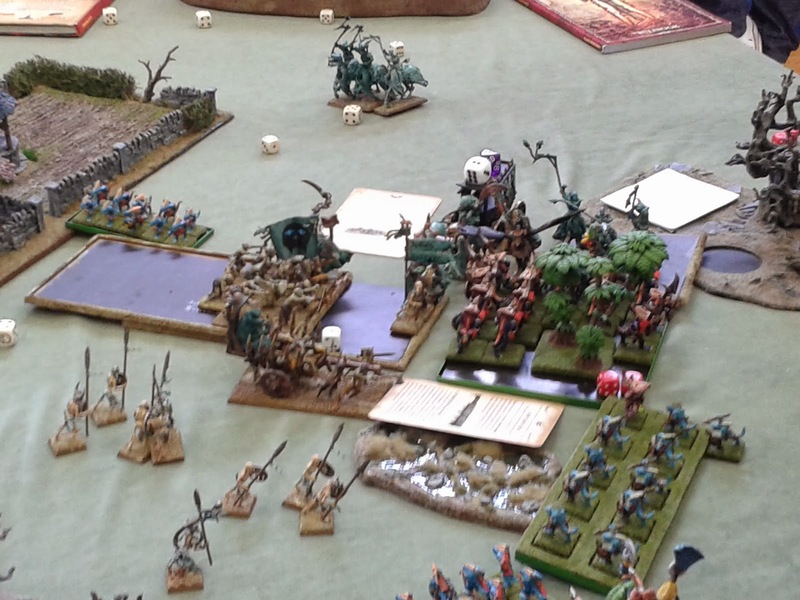 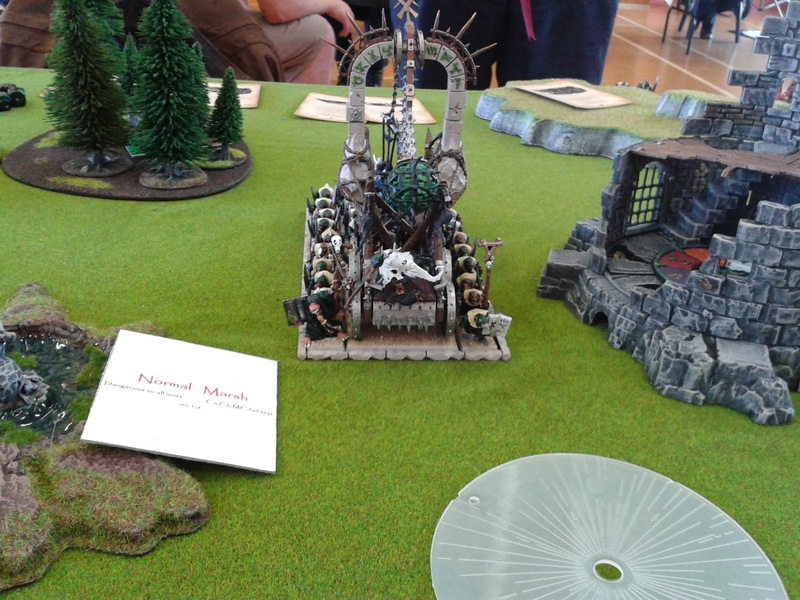 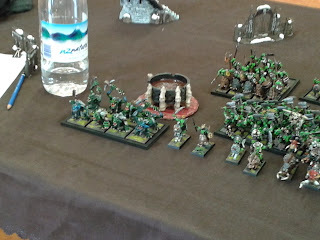 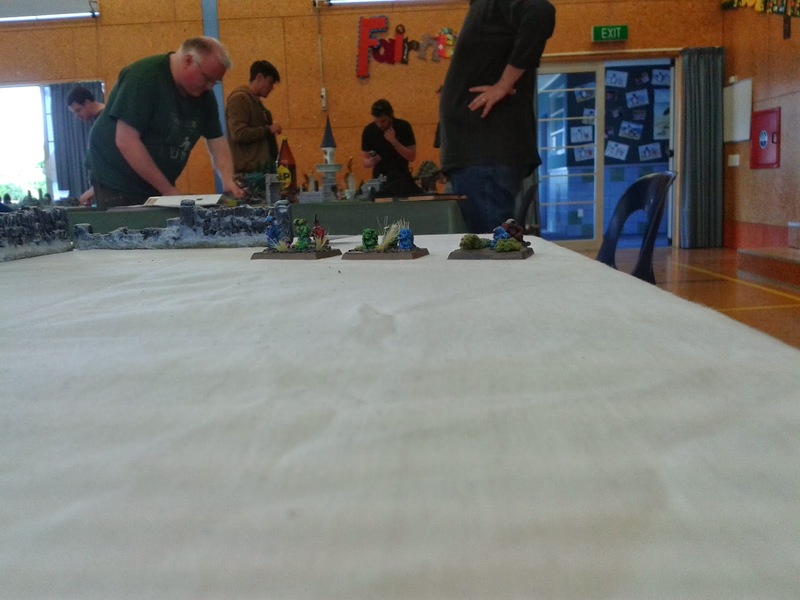 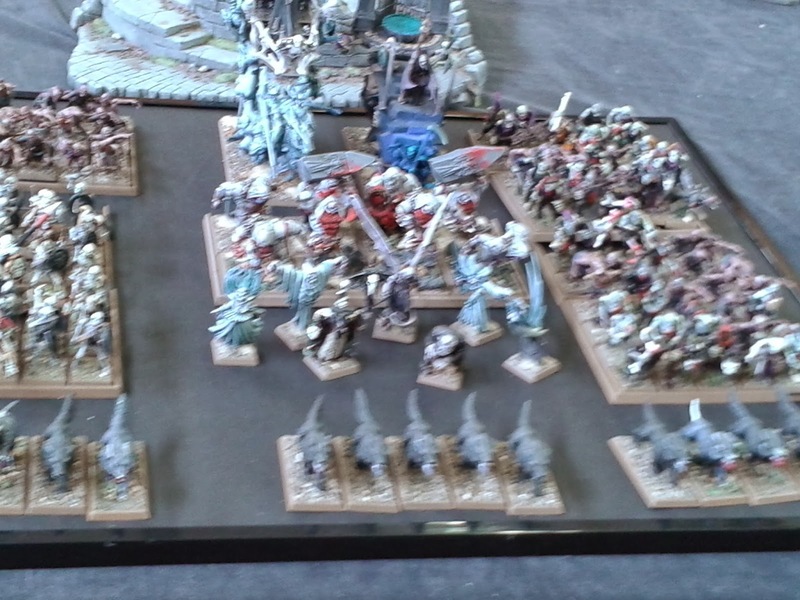 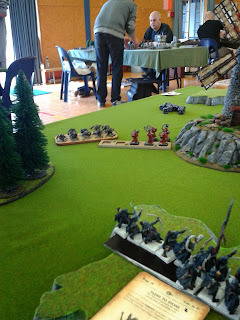 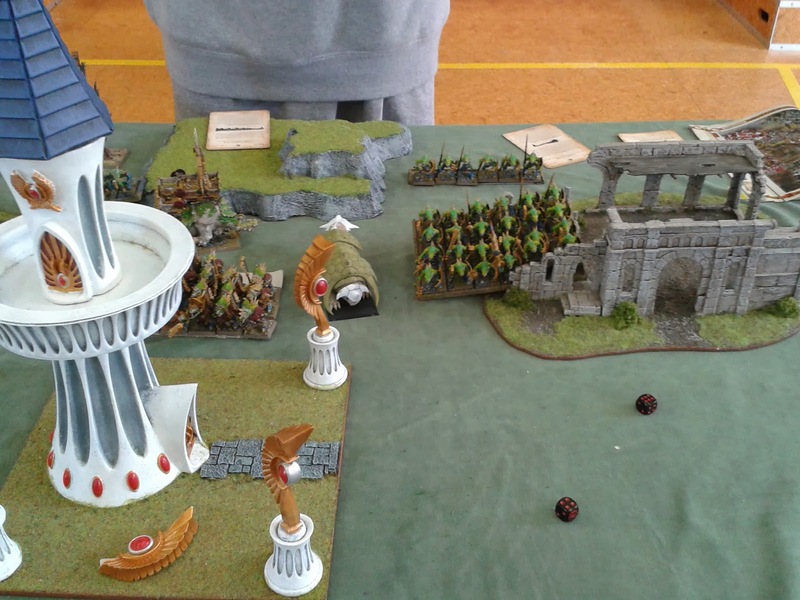 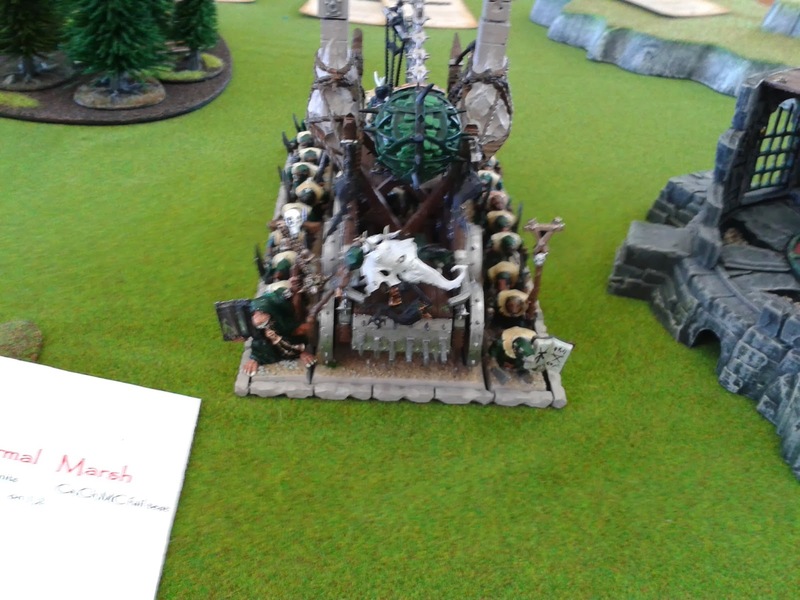 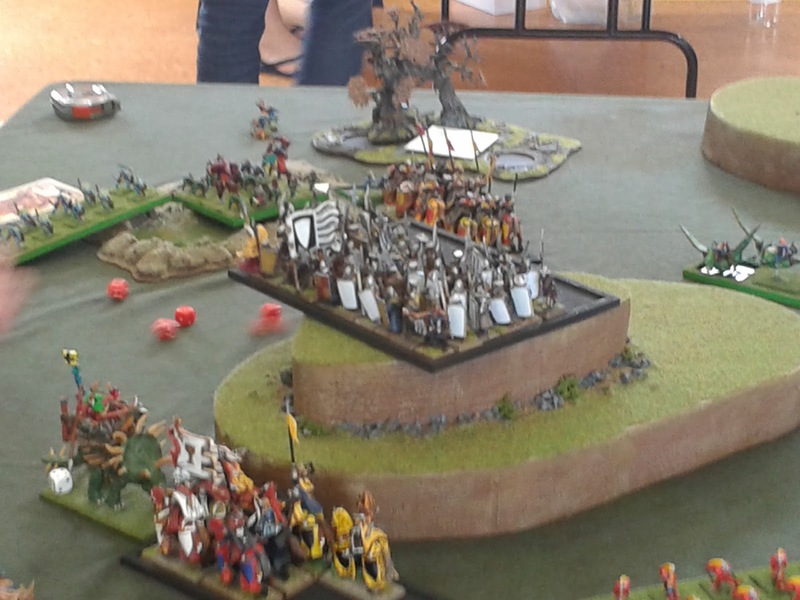 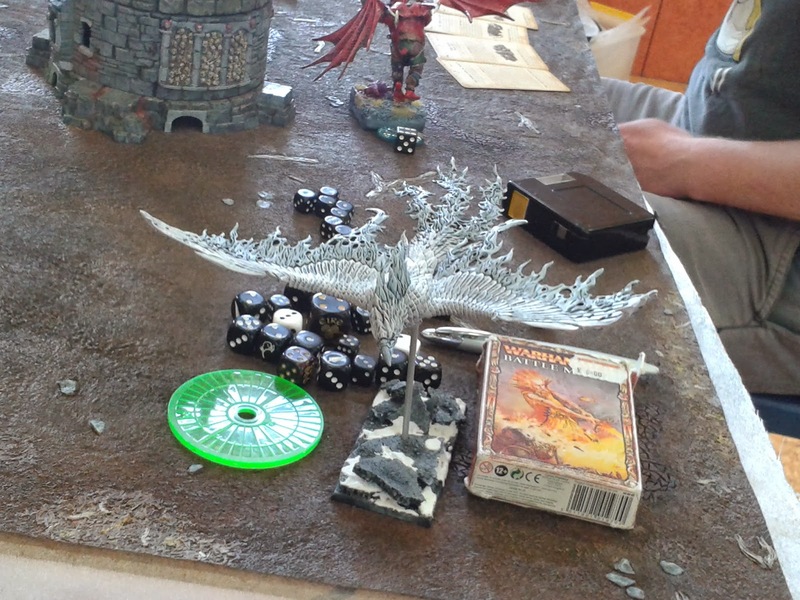 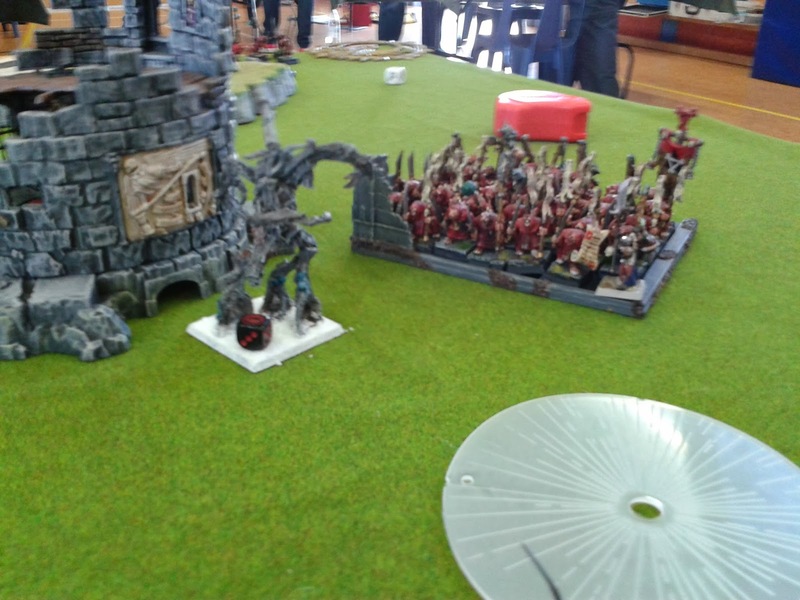 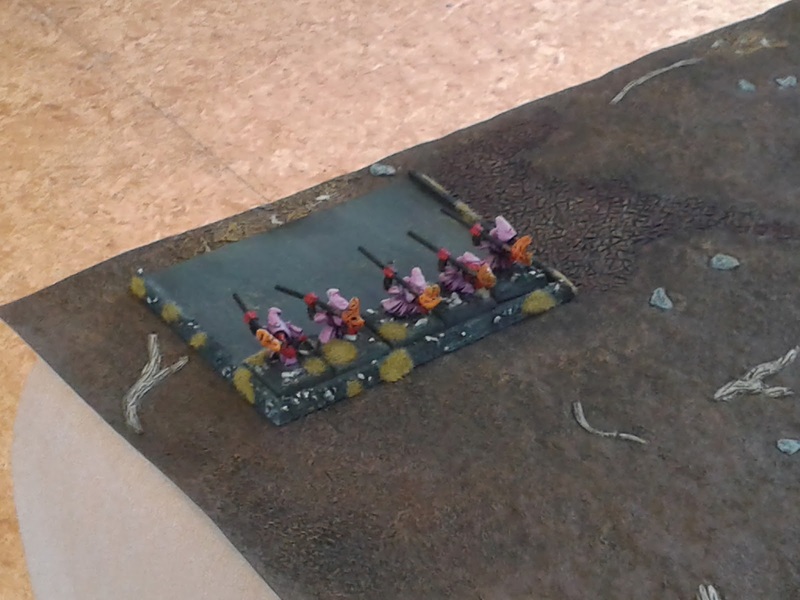 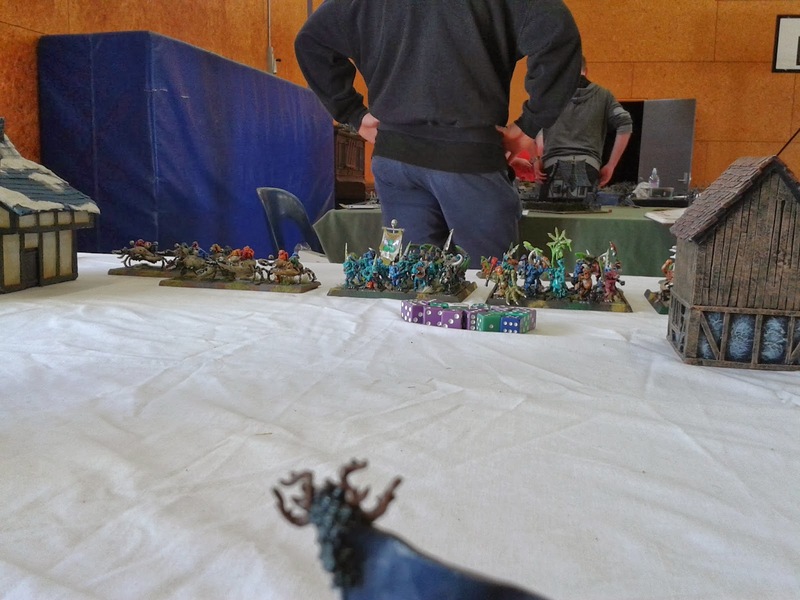 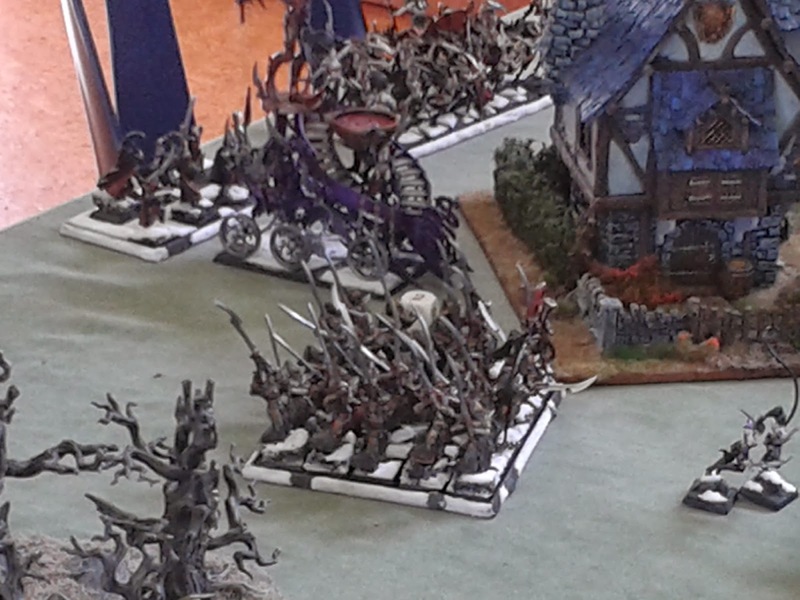 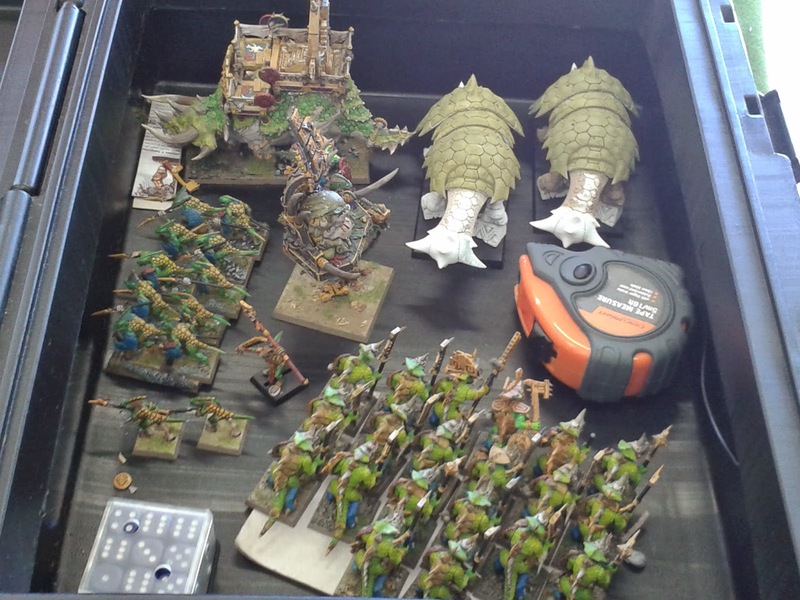 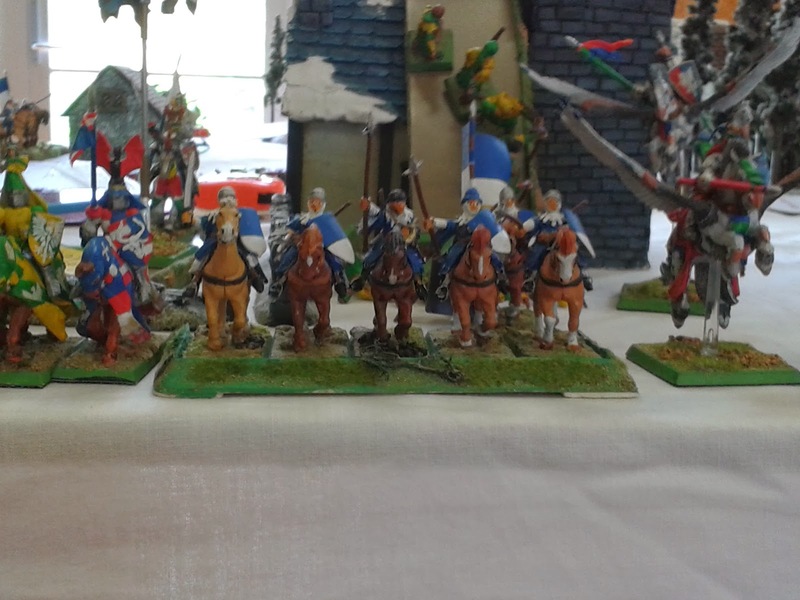 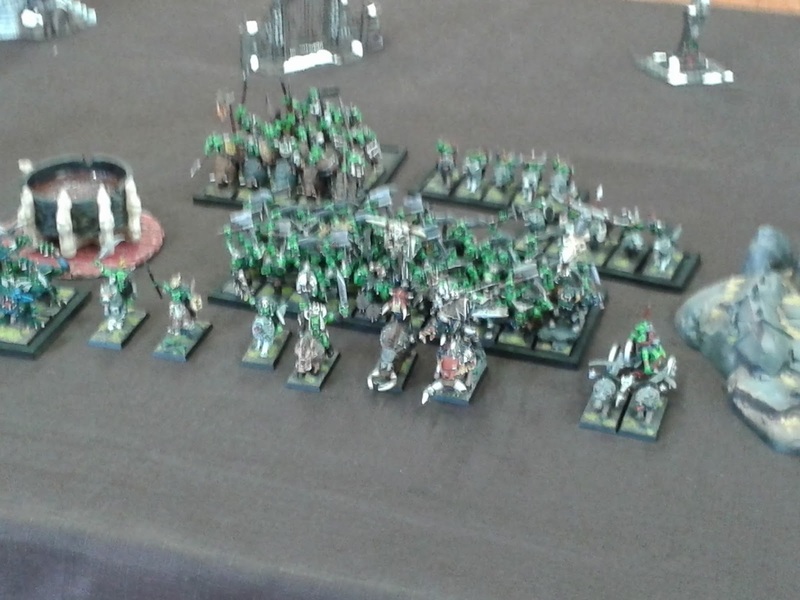 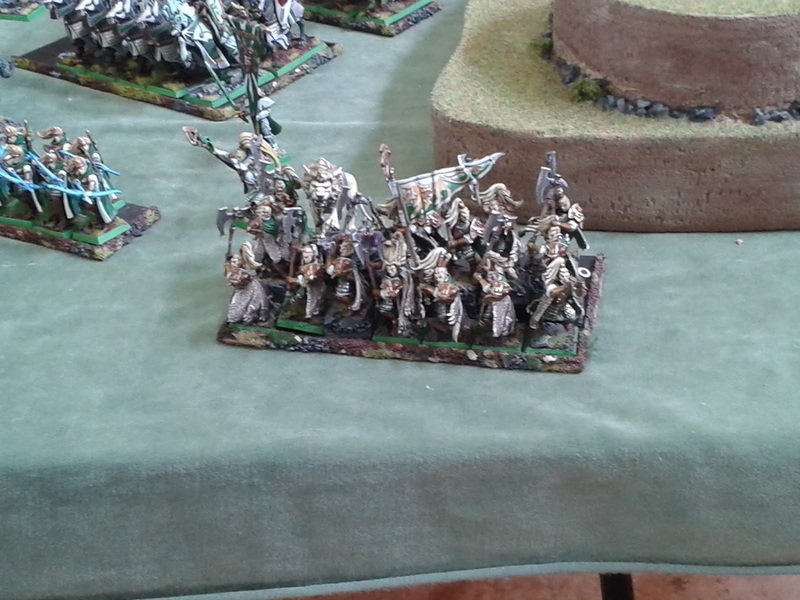 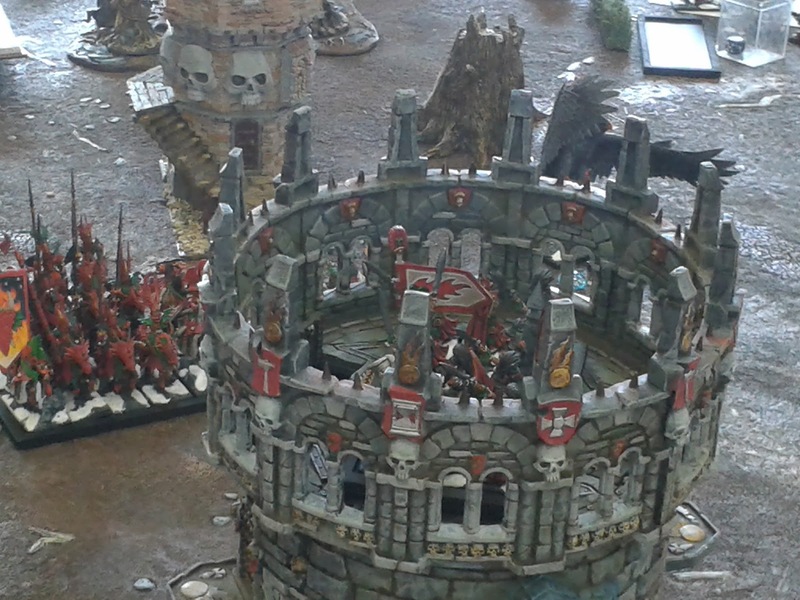 So today was day 1 of the Skitterleap warhammer fantasy tournament, held in wellington. There were 3 games played today with 2 more planned for tomorrow. 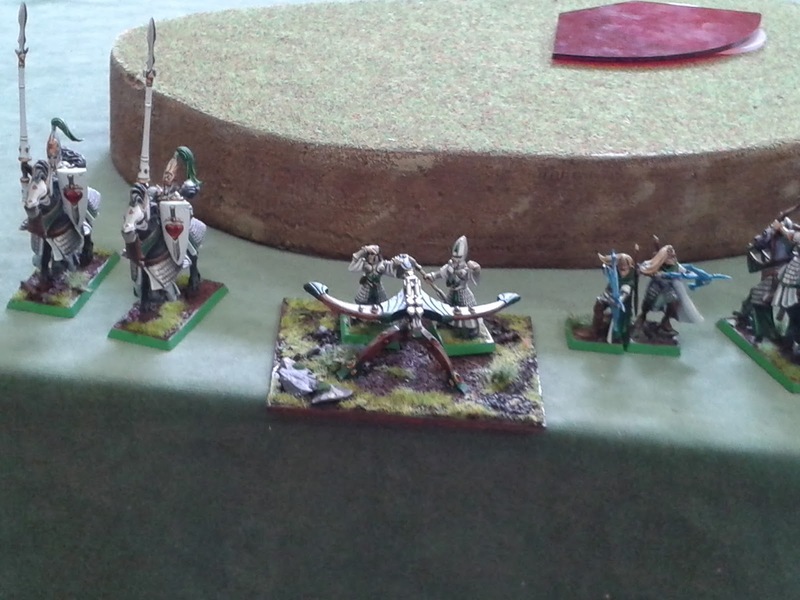 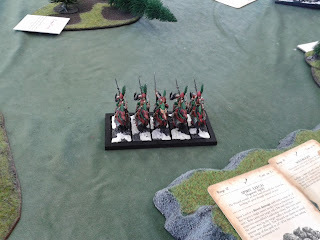 I bought my wood elves and was fairly confident. 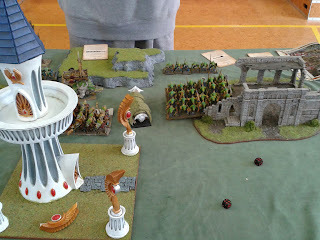 Without further ado lets get into the games. 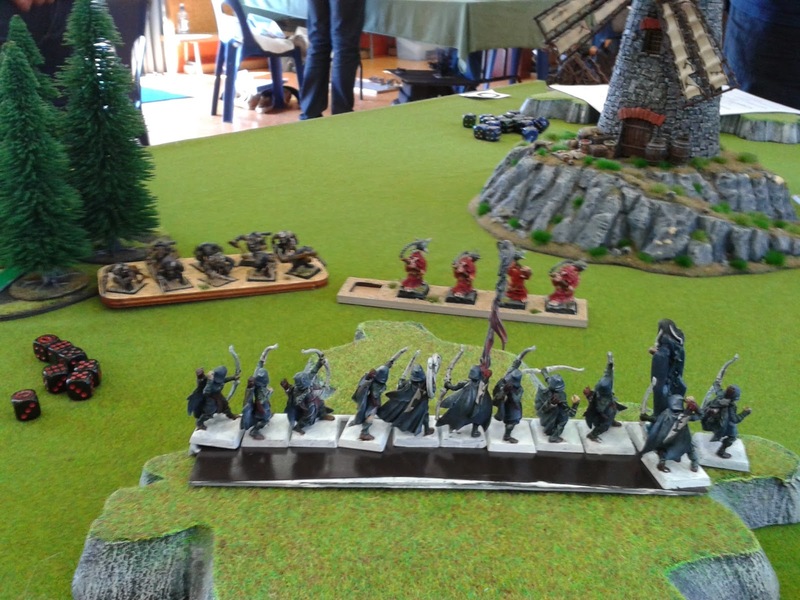 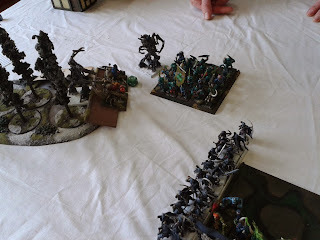 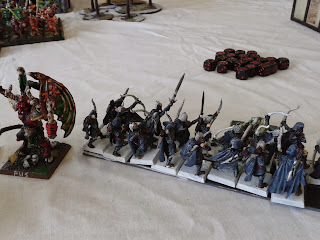 Game 1 was dawn attack (ugh) against a Skaven (Urrrgh) Plague monk list (Urrrrrgh) with Lord Skrolk, a skaven lord level special character who turns plague monks into core troops. Now what with my list being so shooting heavy one if its main ploys was to cause panic checks. However plague monks have frenzy and are as such immune to psychology, so i had to either beat the monks in combat or kill every last one of them. 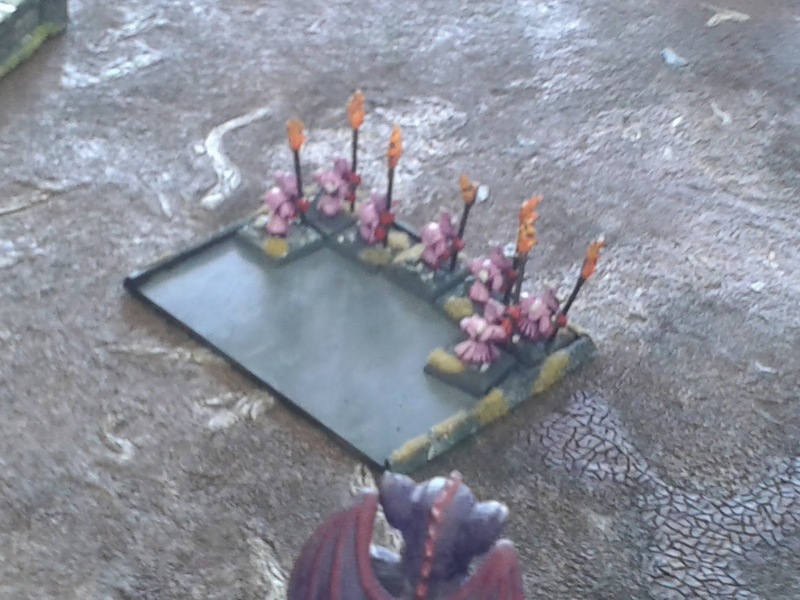 And i didn't succeed in killing them all. This was a case of too many targets. David's list contained (target wise) two big blocks of Plague monks, a doom wheel, a Hell Pit Abomination, two units of gutter runners and a unit of Plague Censer Bearers. 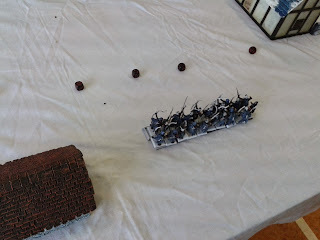 So my three units of twenty archers were hard pressed. 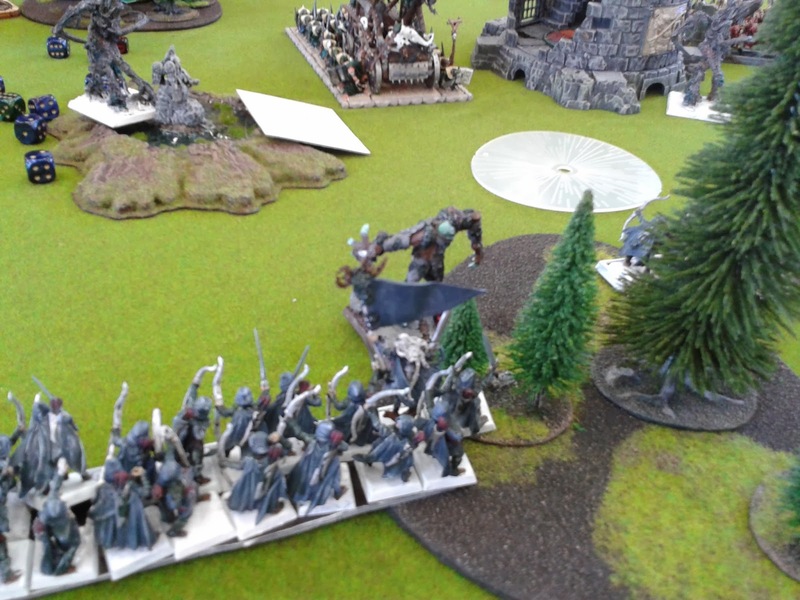 The Treemen/Kin were also hard pressed to hold the line and often found themselves in difficult combats. 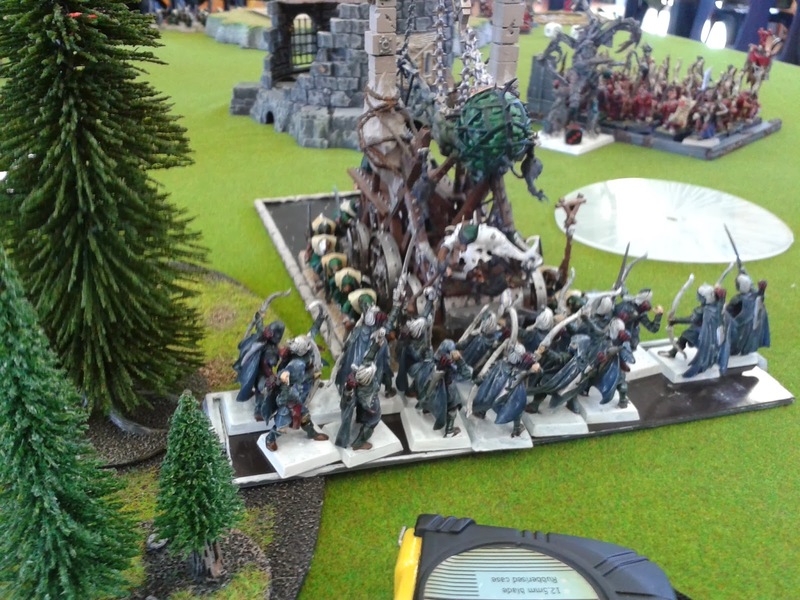 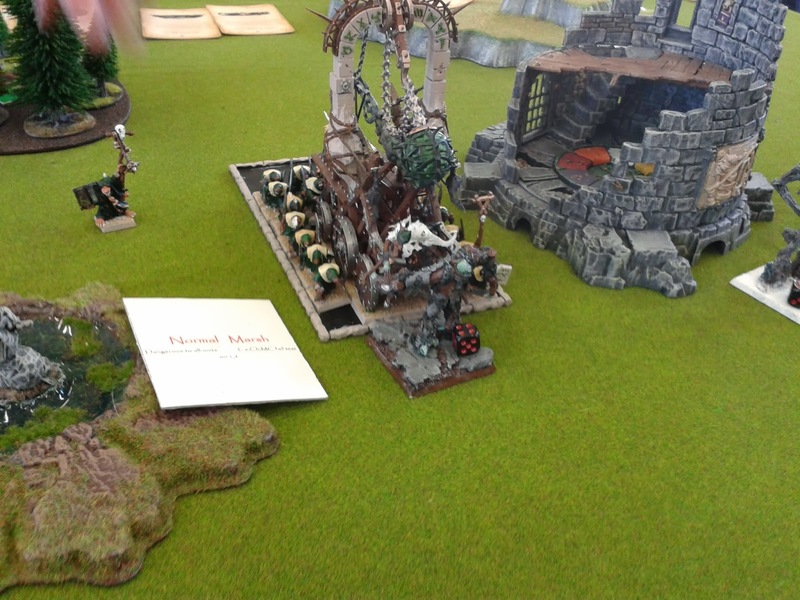 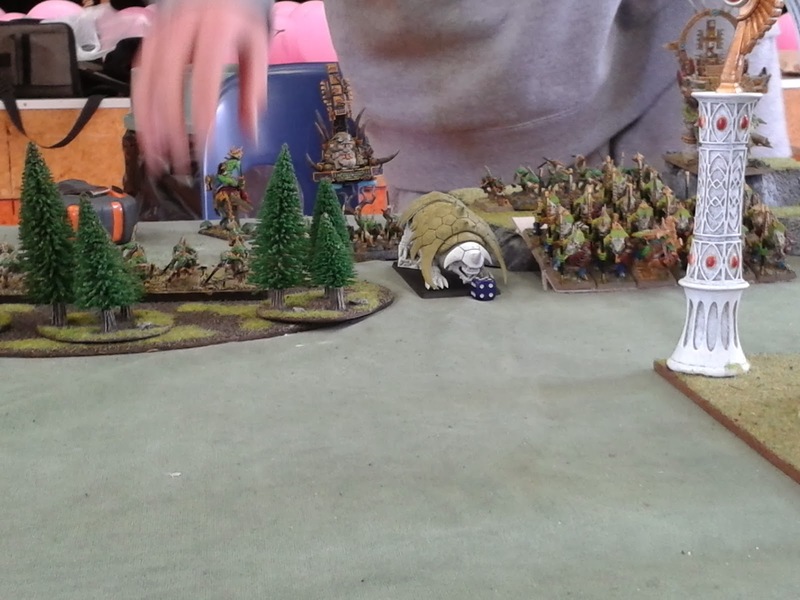 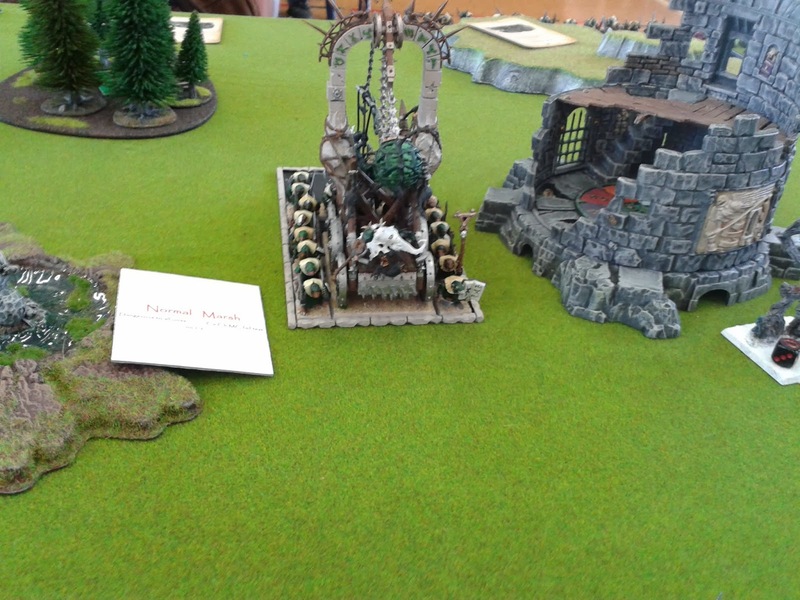 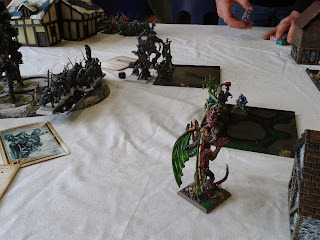 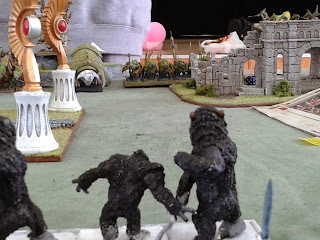 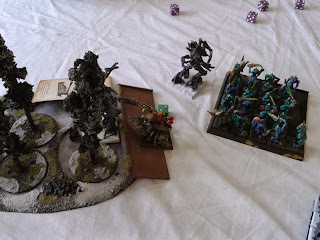 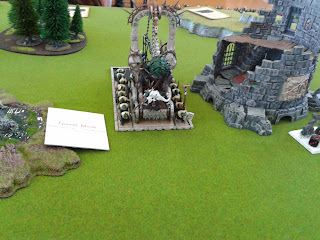 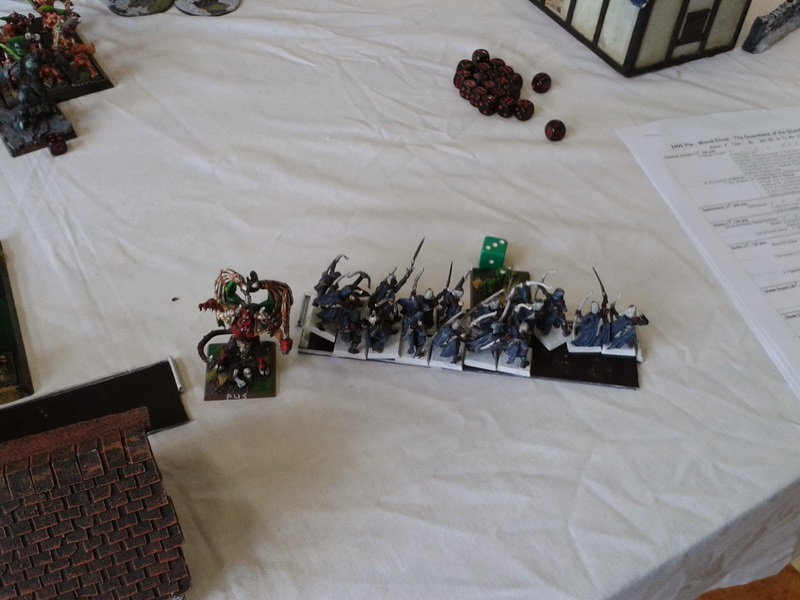 However it wasnt all bad, my Treeman Ancient (Mr Huggy) managed to kill Lord Skrolk (who helpfully took a wound off himself with a miscast) before being murdered by the plague furnace that was in Lord Skrolks unit. 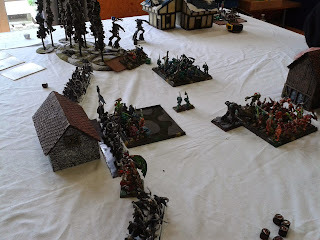 One of the other Treeman was reduced to one wound and then went to last two rounds of combat against the second big plague monk unit. In the end i lost with David taking 17 points and me taking 3. 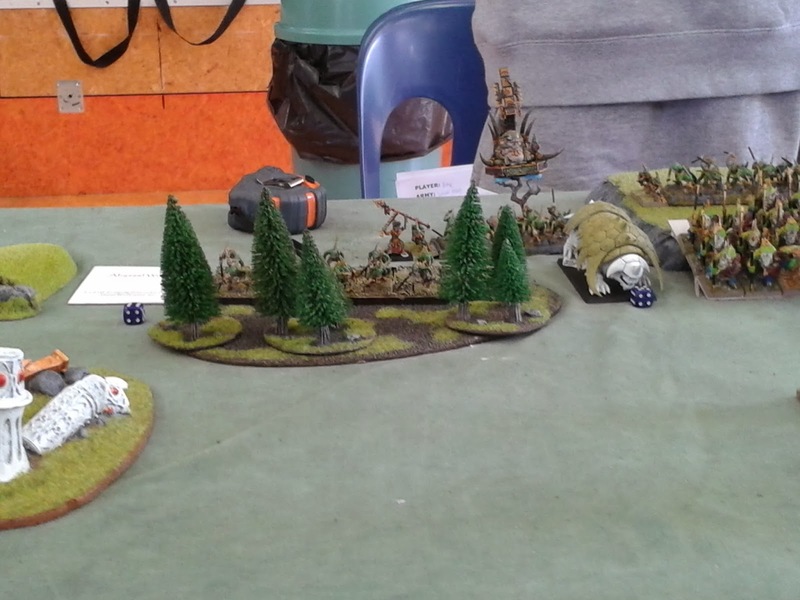 David was a very pleasant opponent who was very polite while he murdered my wood land loving elves. It was round 2 against Mark Stanton, having faced him in CTA and lost. 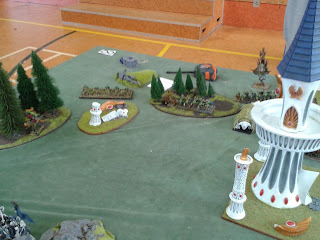 However this time was different. It was Blood and Glory (which didn't matter as neither one of us broke the other, again) and the deployment for this scenario was strange. 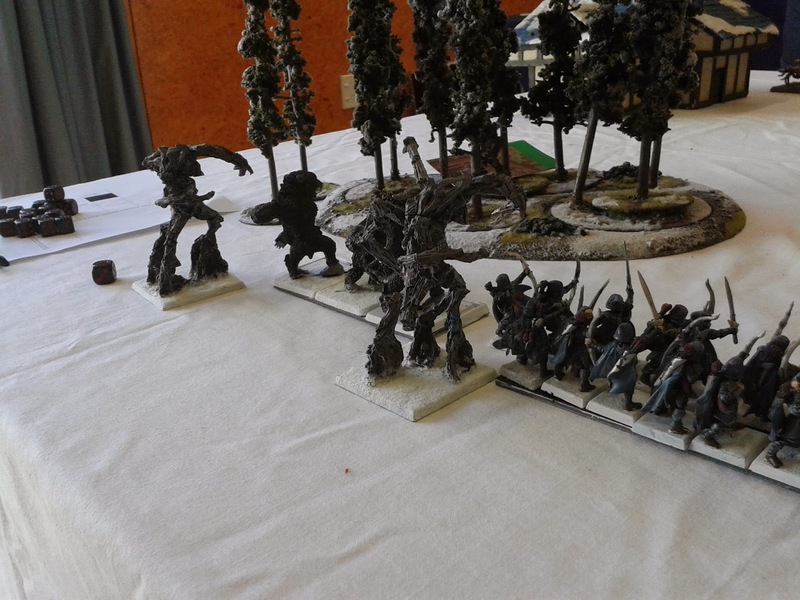 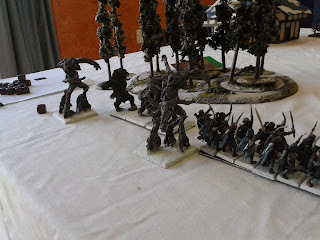 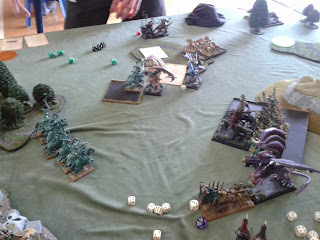 Mark had placed two units of three Beasts of Nurgle and twenty Plaguebearers on the right flank and in response i placed two Treemen and three Treekin on the same flank. 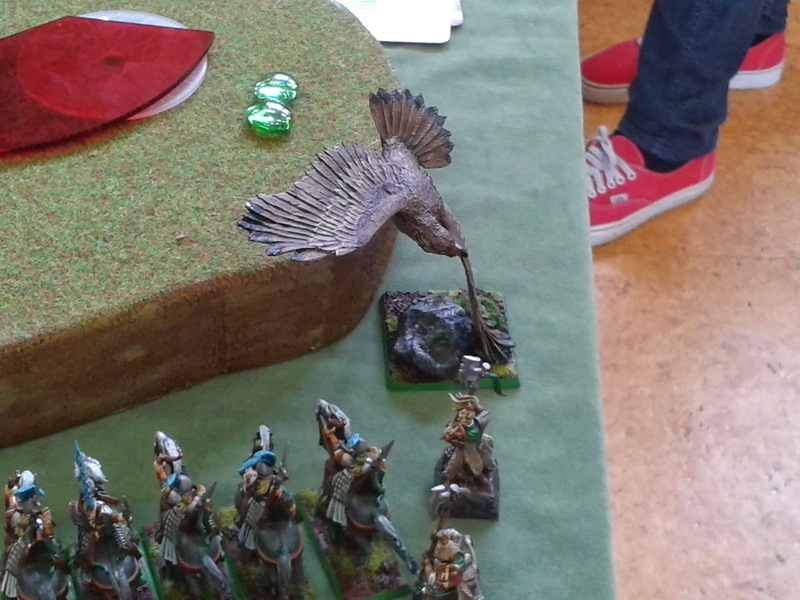 And that flank won me the game. Mr Huggy took the centre and soloed twenty Plaguebearers and a Herald (who he challenged and murdered) which gave plenty of time for the Treemen/Kin to take care of their flank. 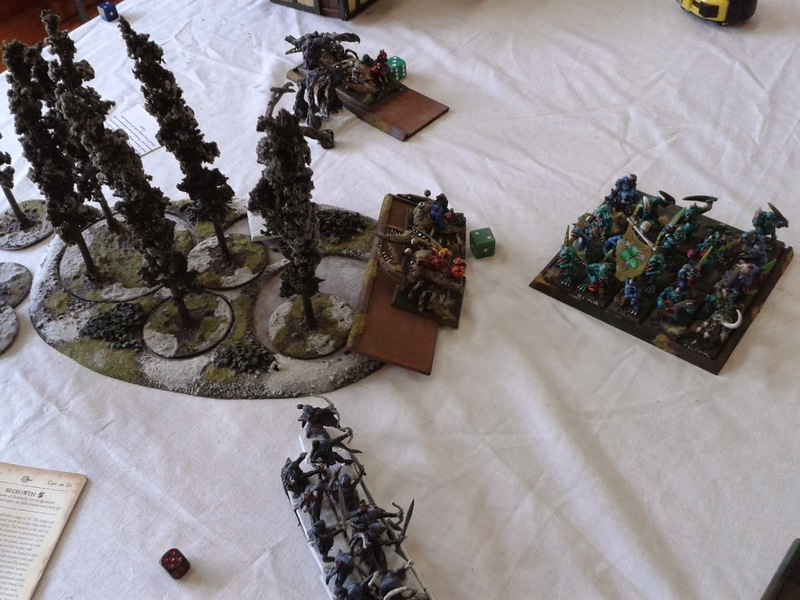 After they had finished with that flank the two remaining Treemen went on to mop up what was left, which wasn't much. Everything worked for me in this game with the pinnacle being twenty glade guard shooting off a demon prince. 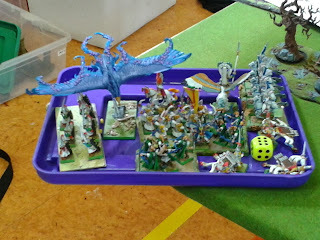 In the end it was a 15-5 to me. Mark was once again a great opponent. 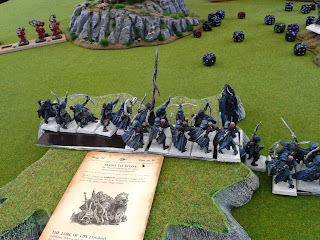 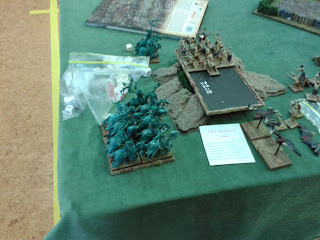 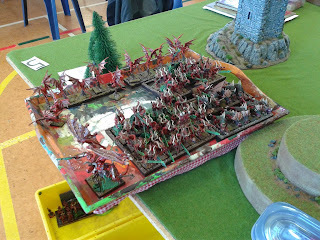 This was both my first game against lizardmen (ever) and my first game of watchtower (ever). And both those things helped to make this game a crushing defeat. 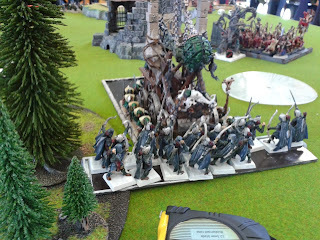 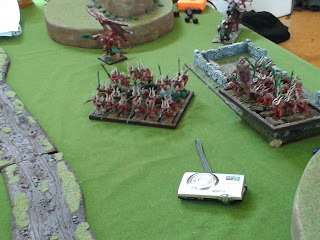 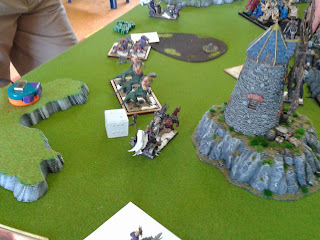 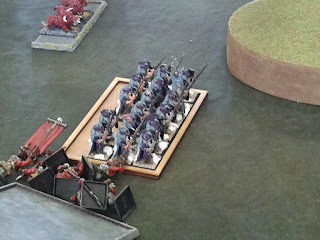 While i did claim the watchtower early Bo quickly took it with a super buffed up unit of temple guard. And he then went on to hold said tower for the rest of the game. 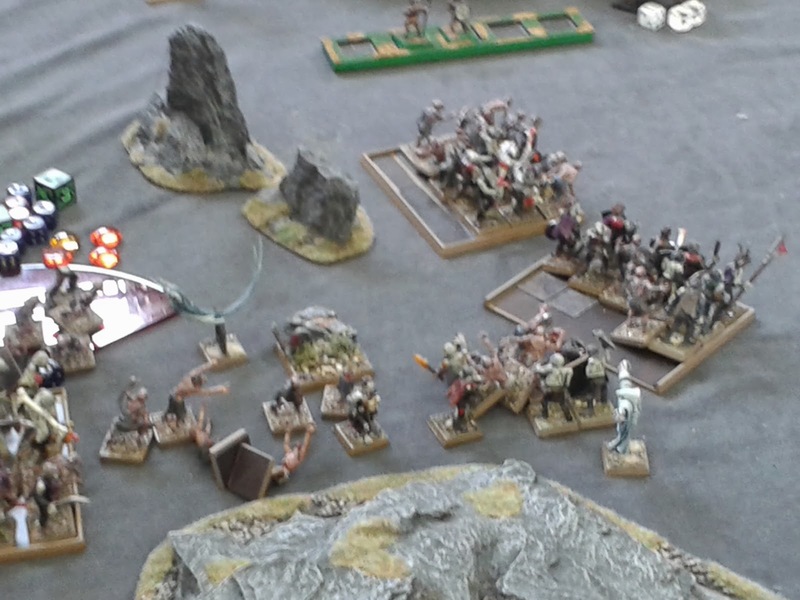 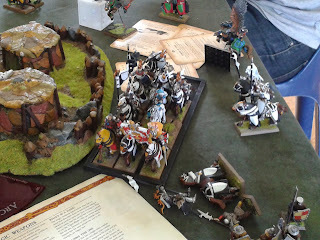 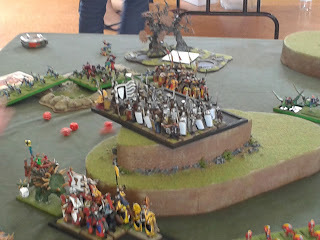 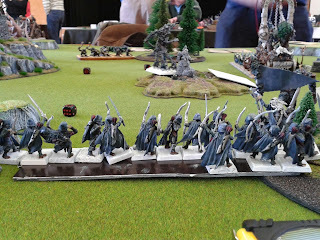 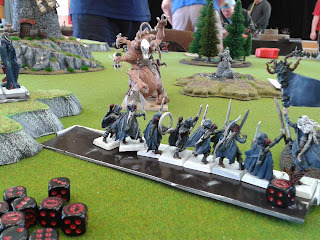 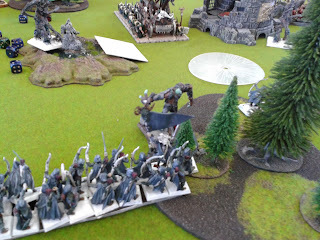 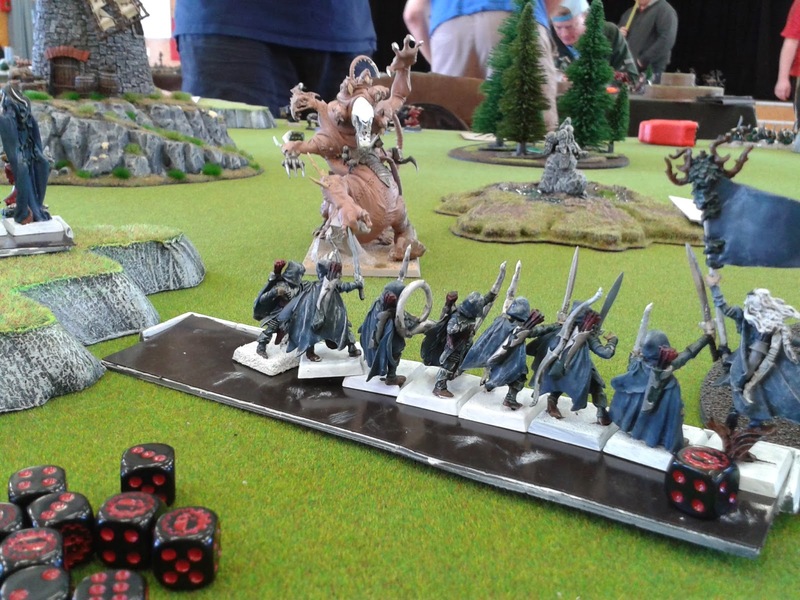 Other events of note included Mr Huggy getting reduced to one wound from a amber spear, both of our level 4 wizards being reduced to level 1 and loosing 3 spells, the Stegadon Ancient being killed by stand and shoot strangleroots, and the hail of doom arrow being destroyed before it could fire. IN the end Bo held the watchtower and wiped out all but twenty glade guard. 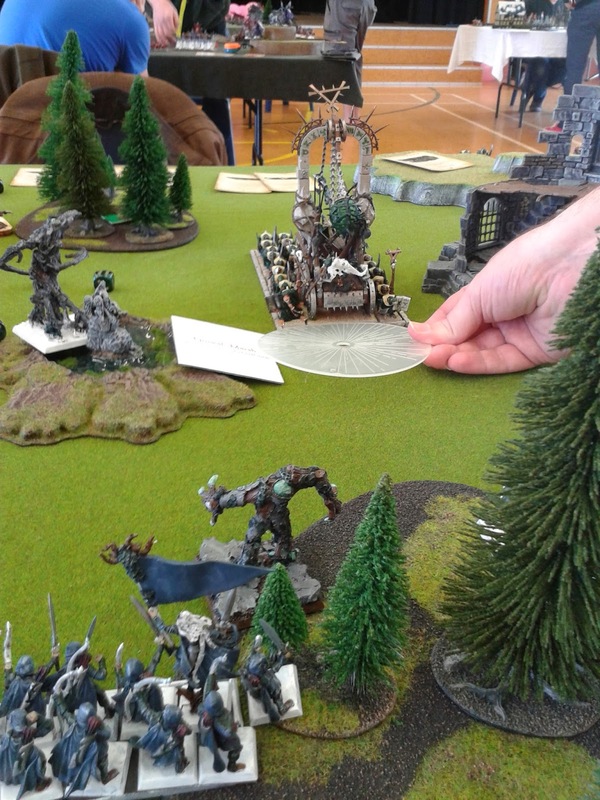 A well deserved 20-0 to a very good and polite opponent. 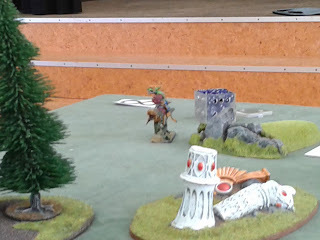 I will leave you now with images from day 1 of skitterleap. 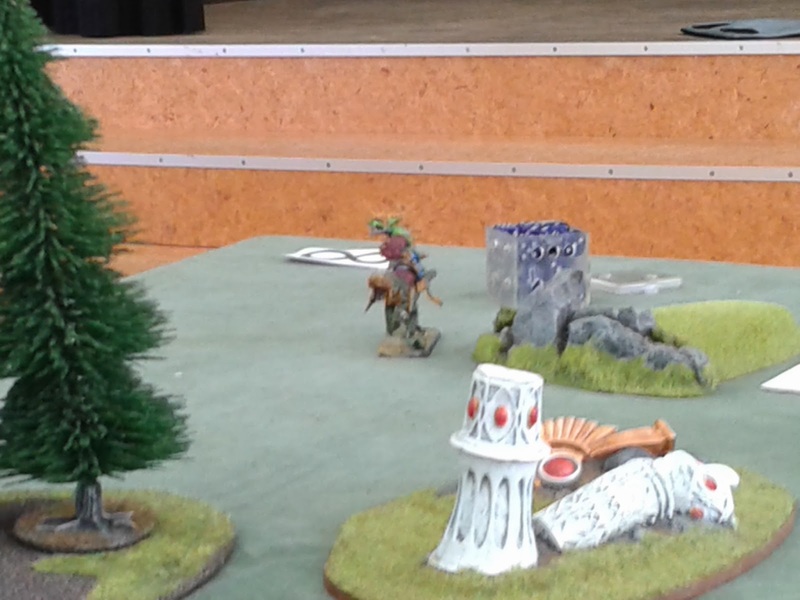 Tomorrows first game will be battle for the pass (yaay) against Andrew Stanton (the second time facing him). Until next time.